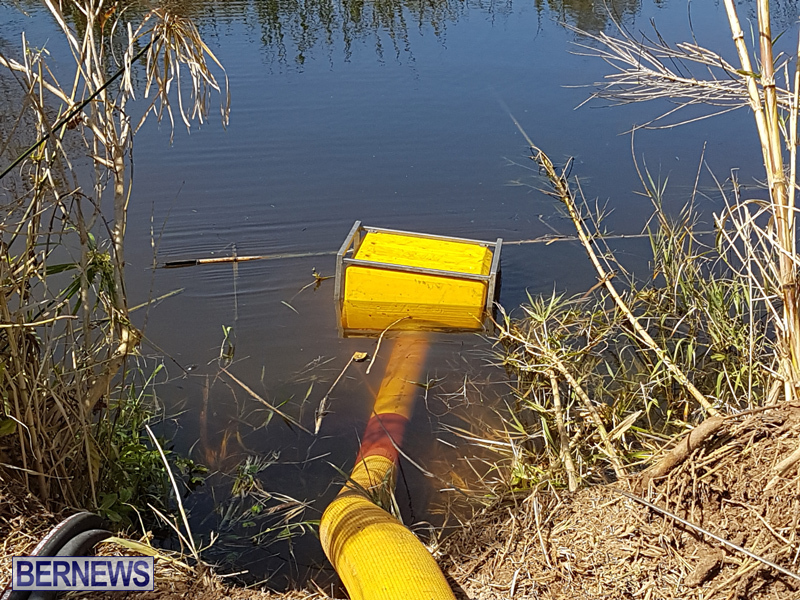 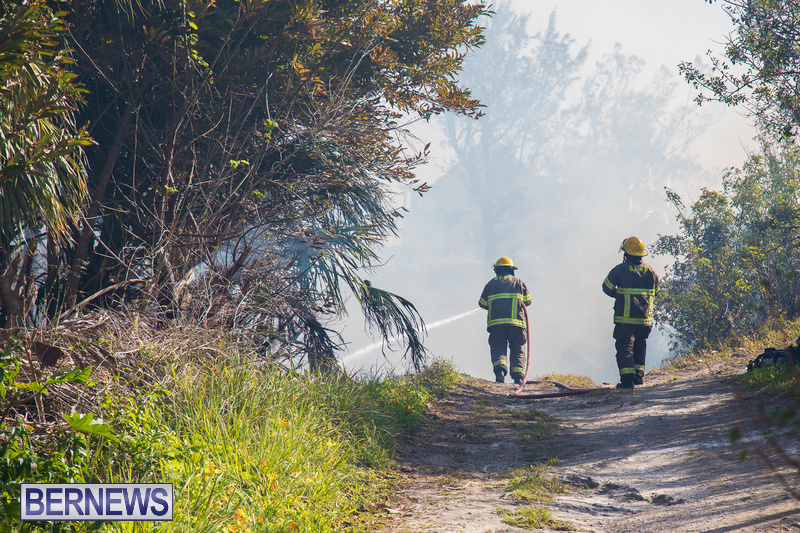 [Updating] Firefighters are currently battling a blaze in the marsh area of Devonshire this morning [March 17], with flames seen in the marsh as smoke pours into the air. 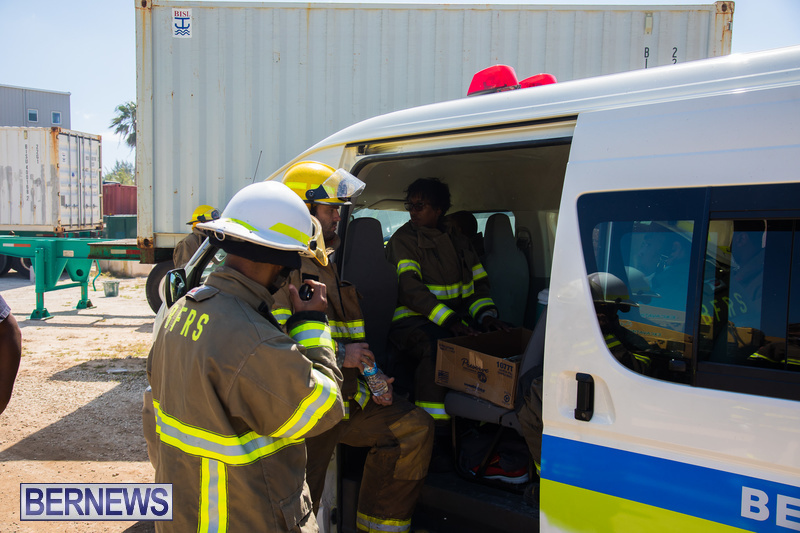 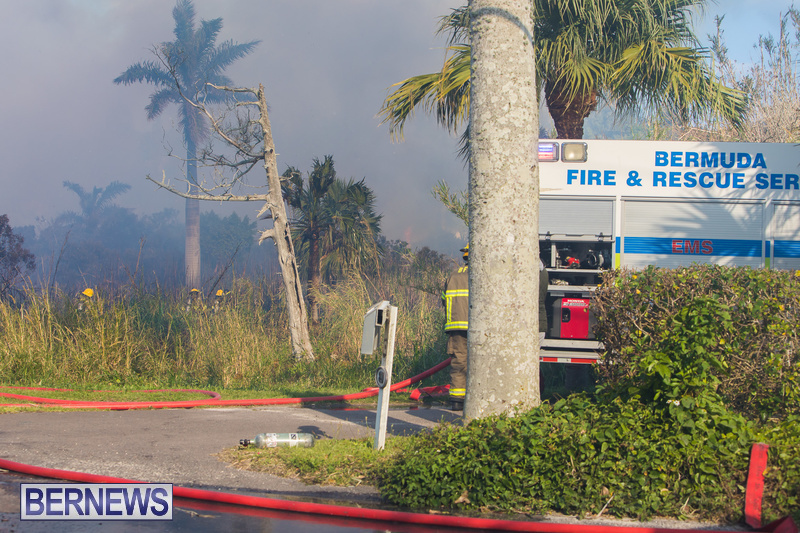 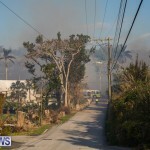 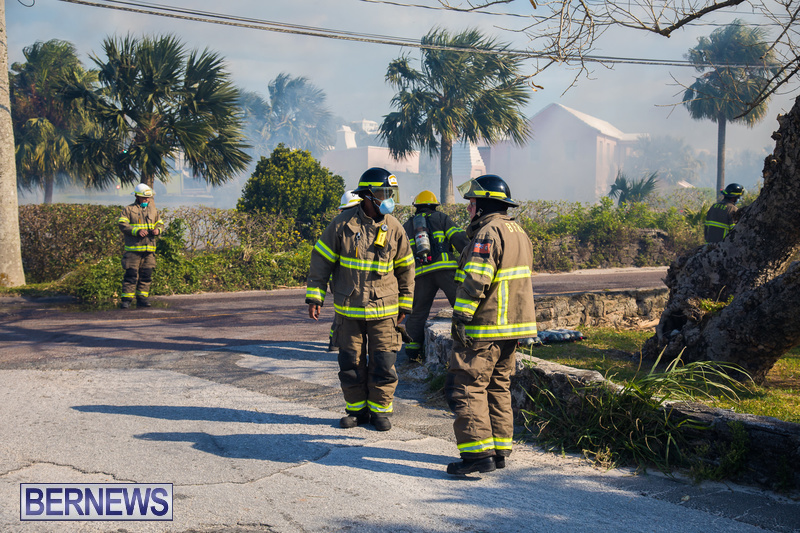 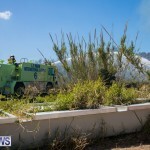 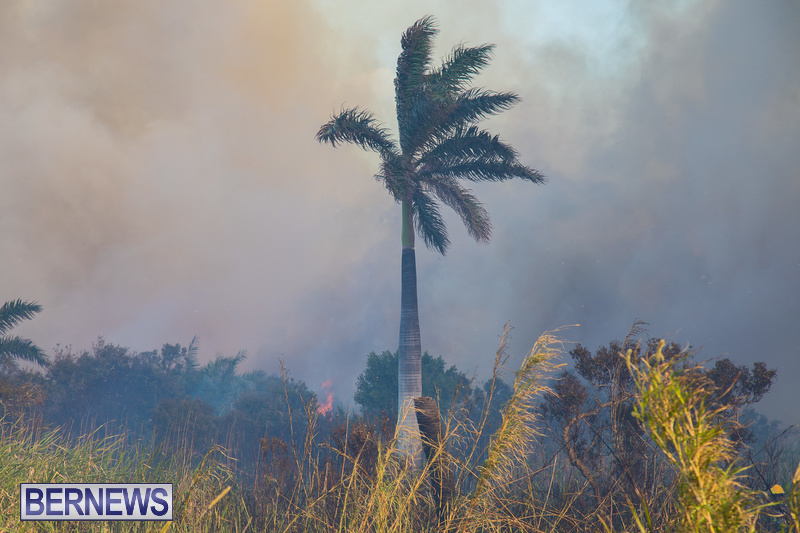 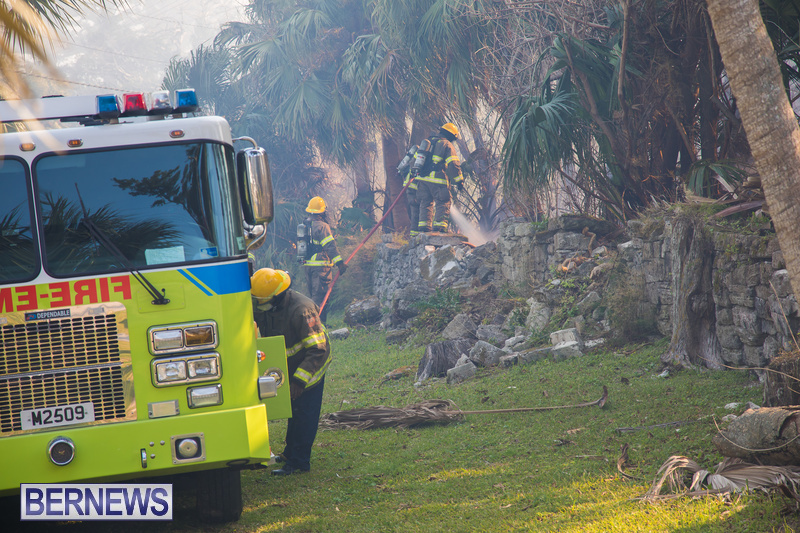 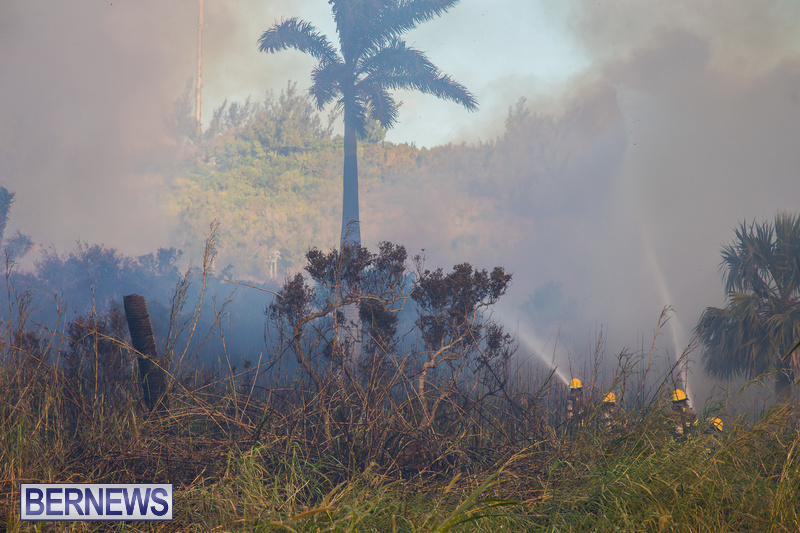 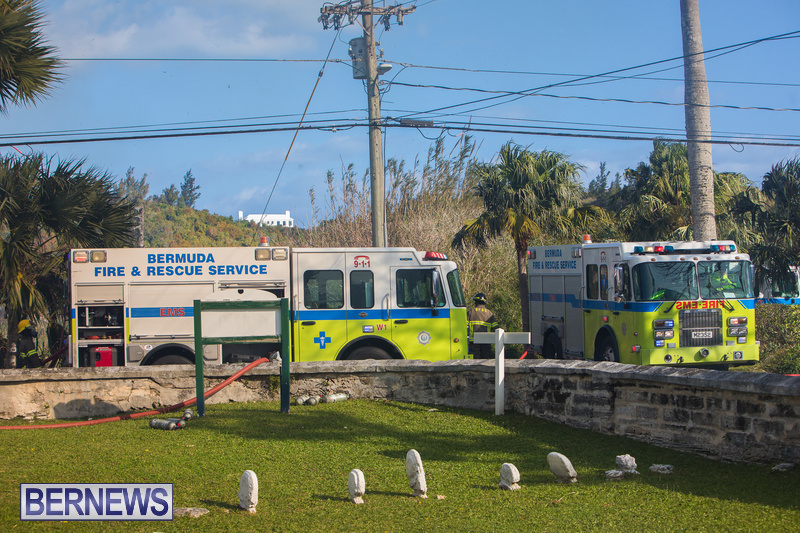 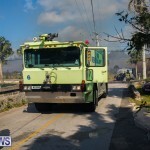 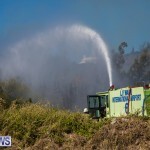 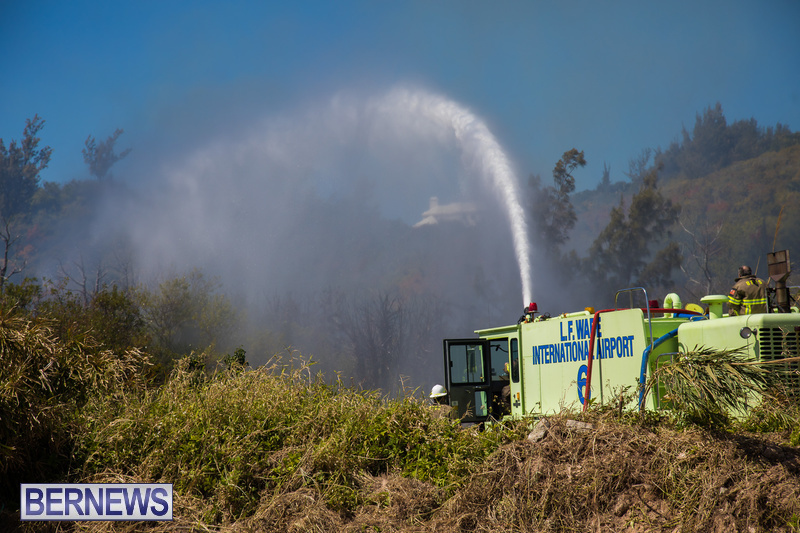 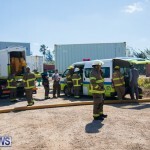 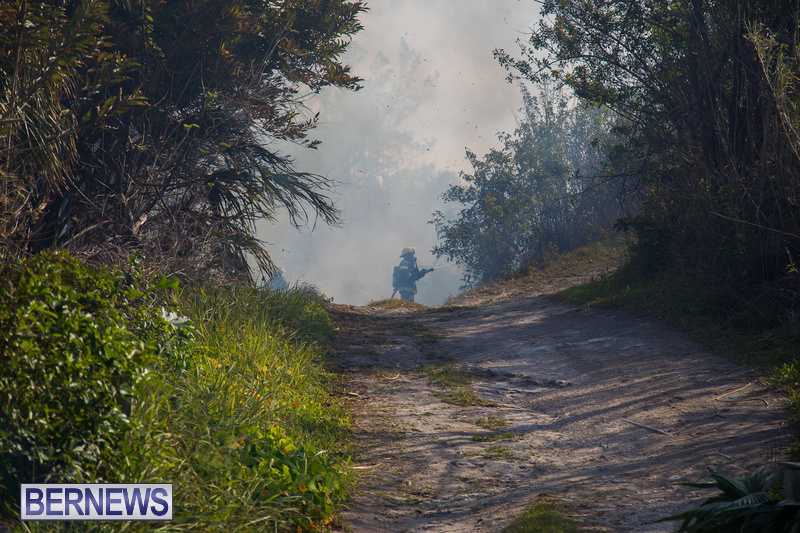 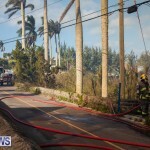 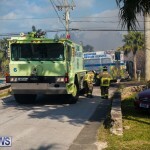 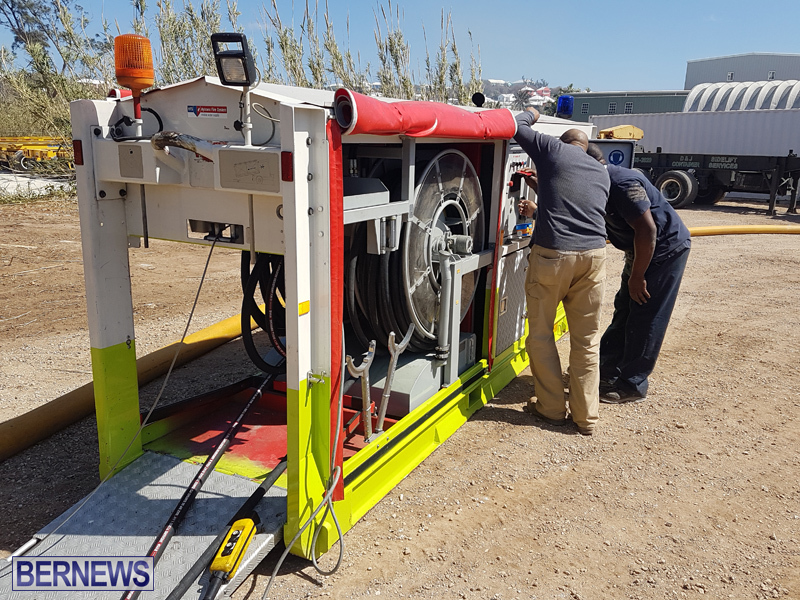 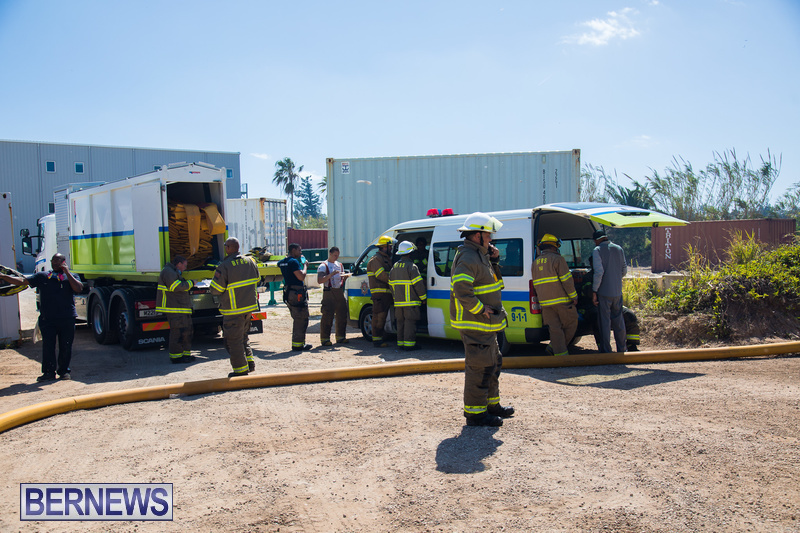 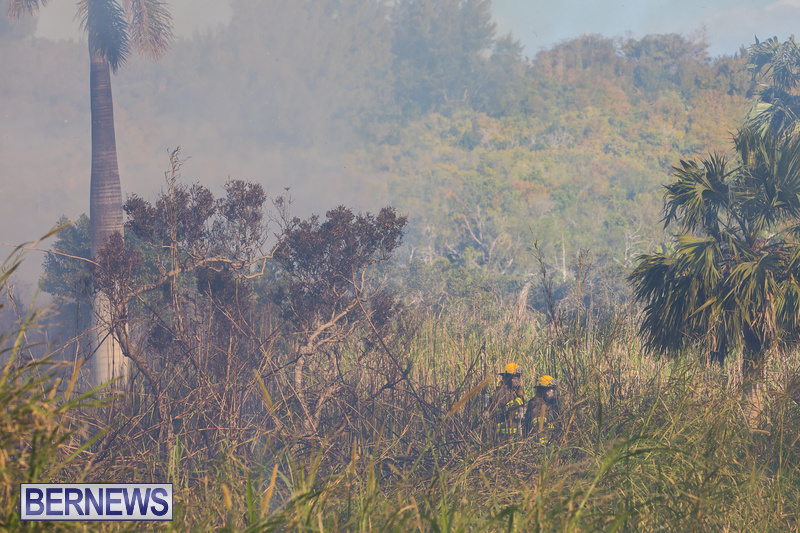 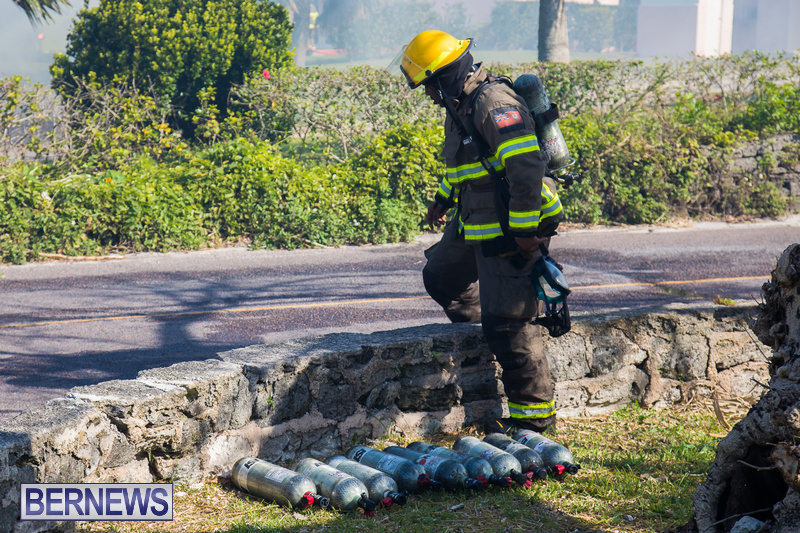 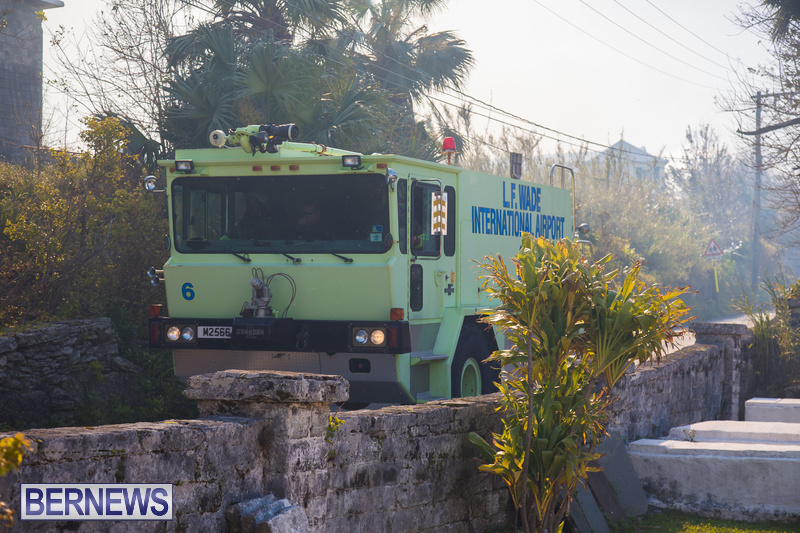 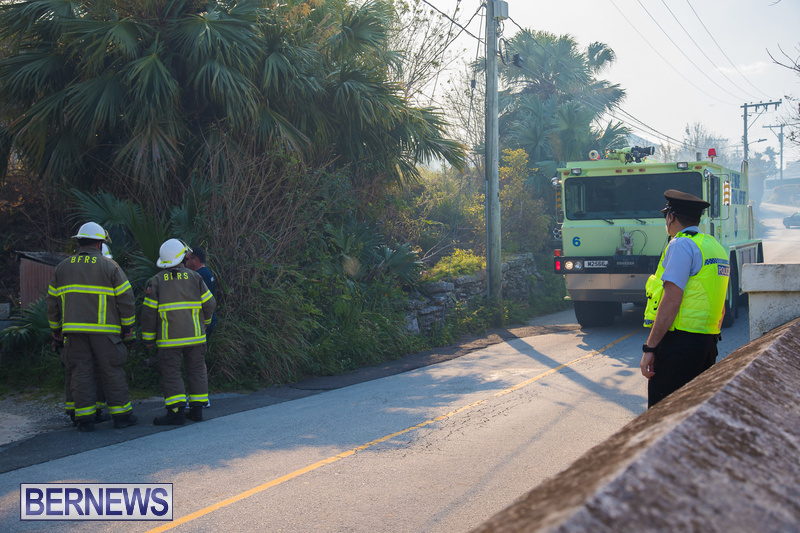 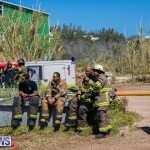 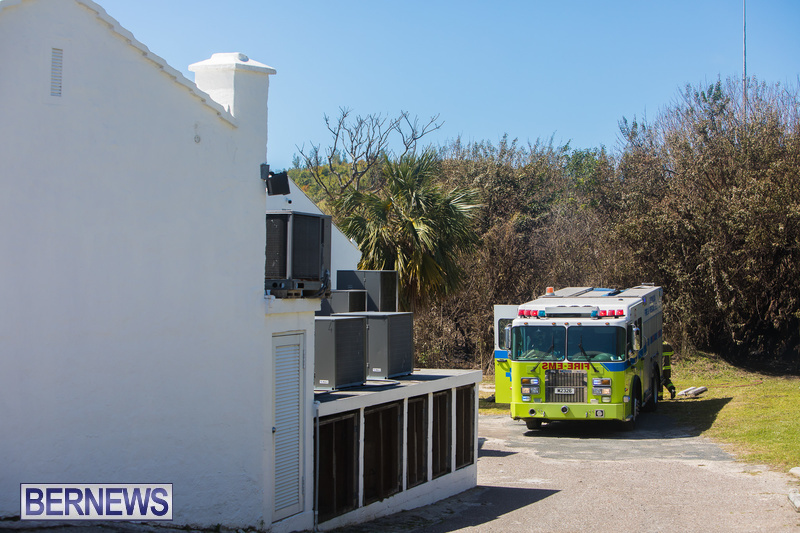 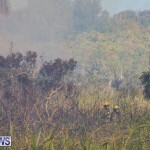 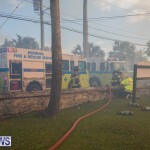 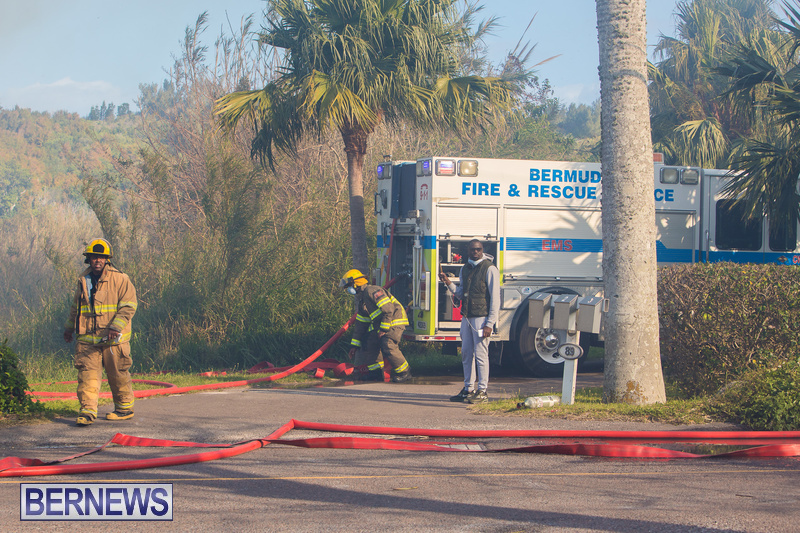 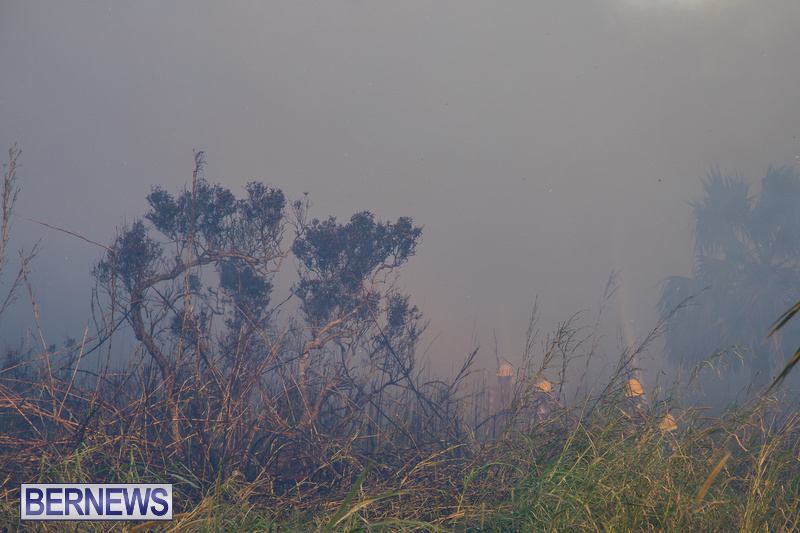 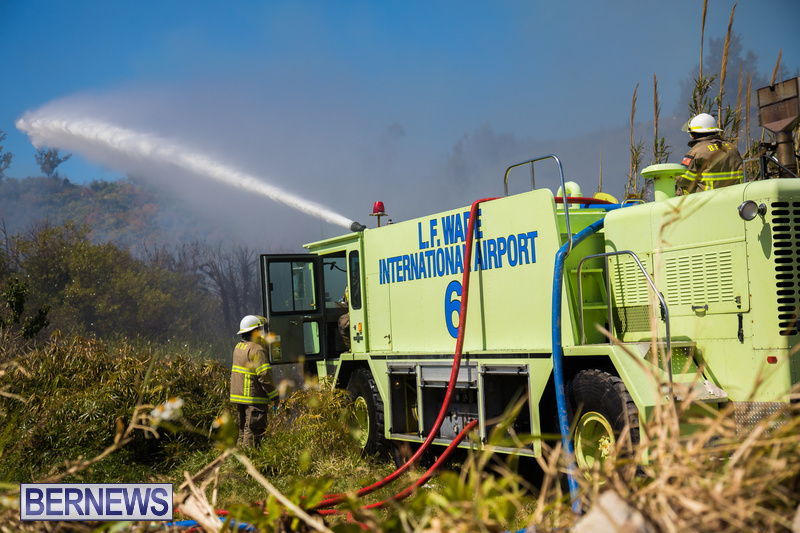 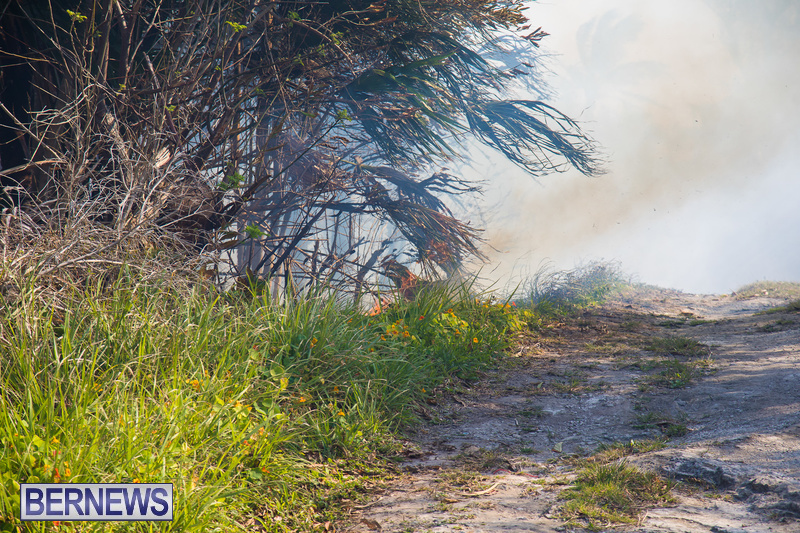 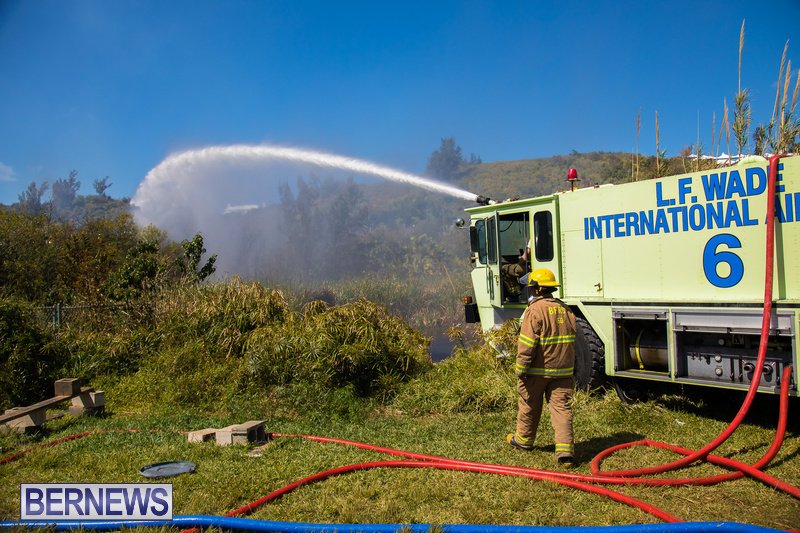 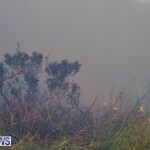 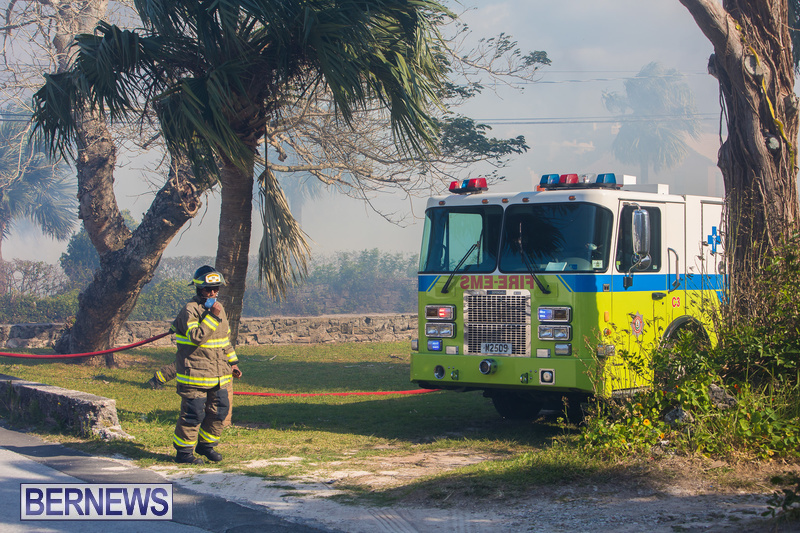 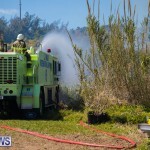 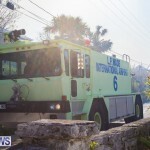 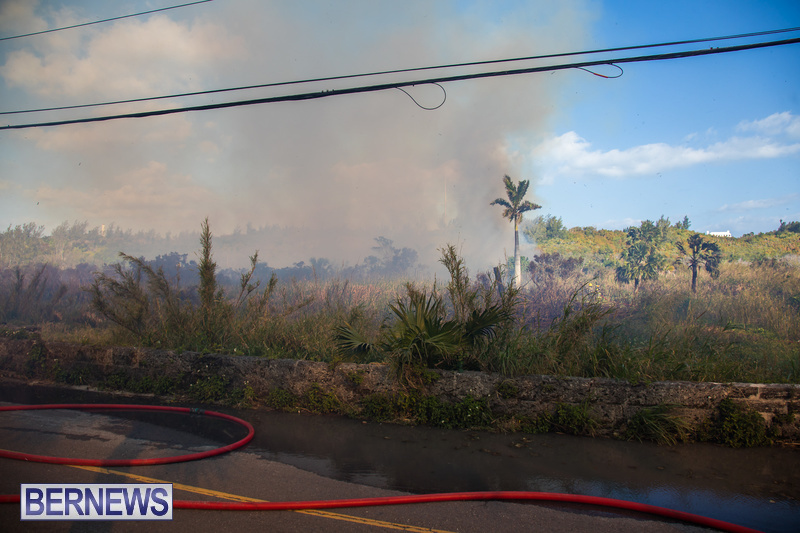 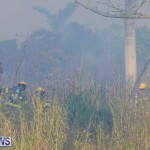 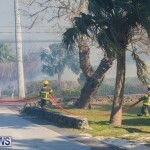 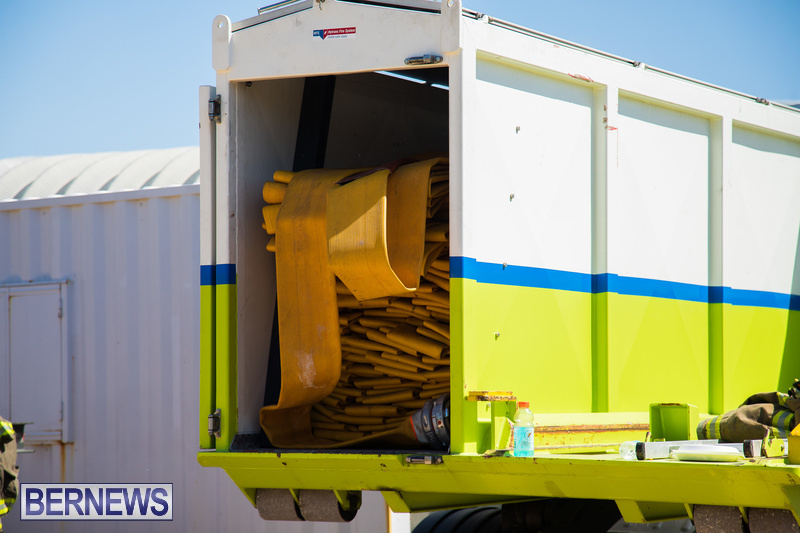 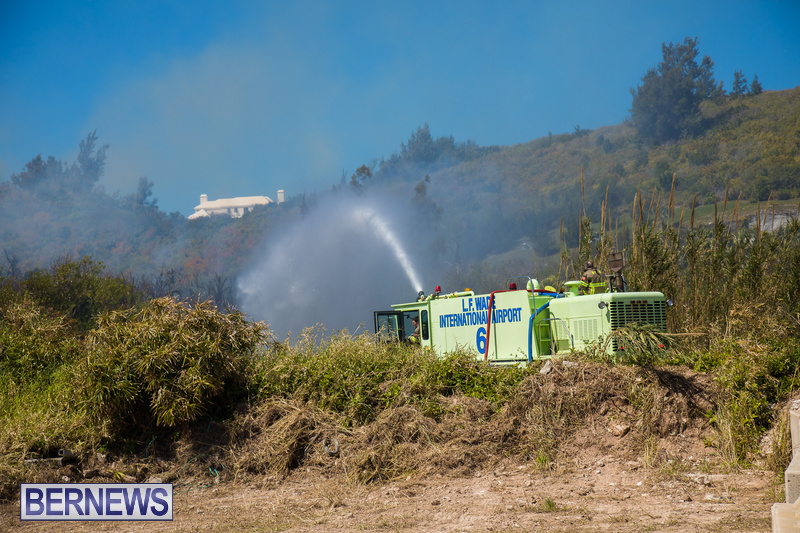 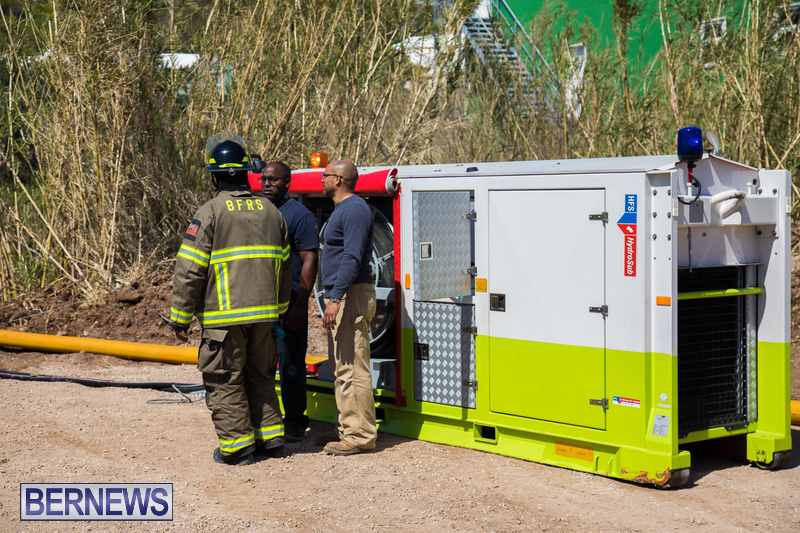 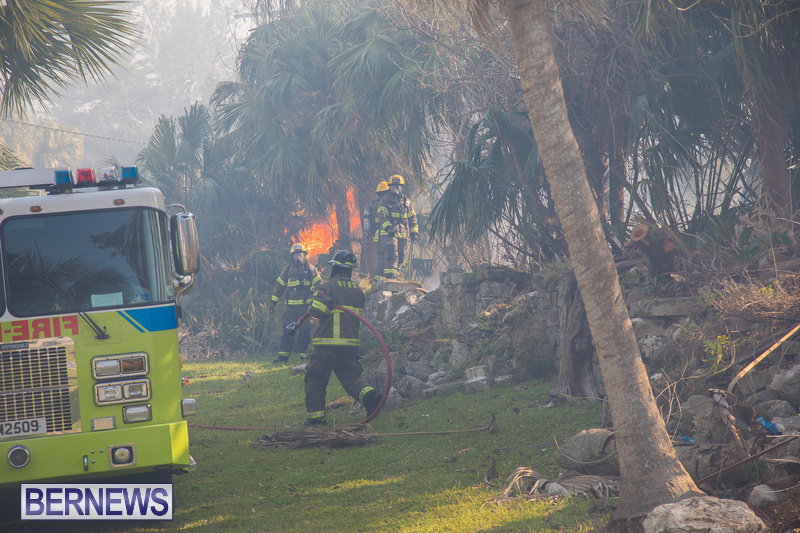 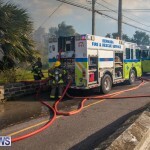 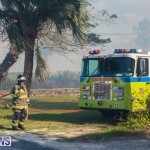 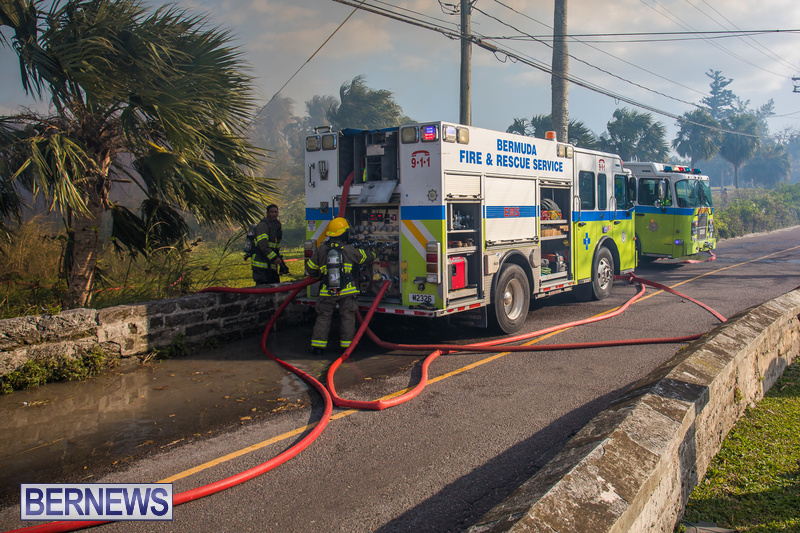 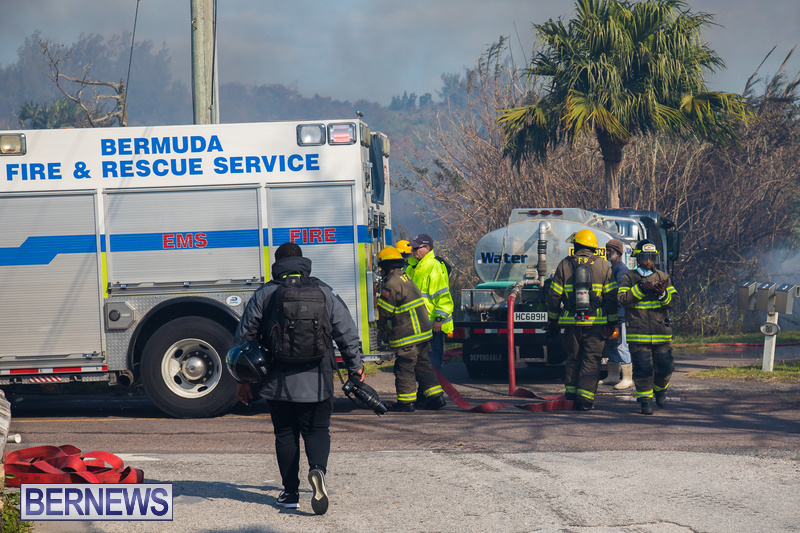 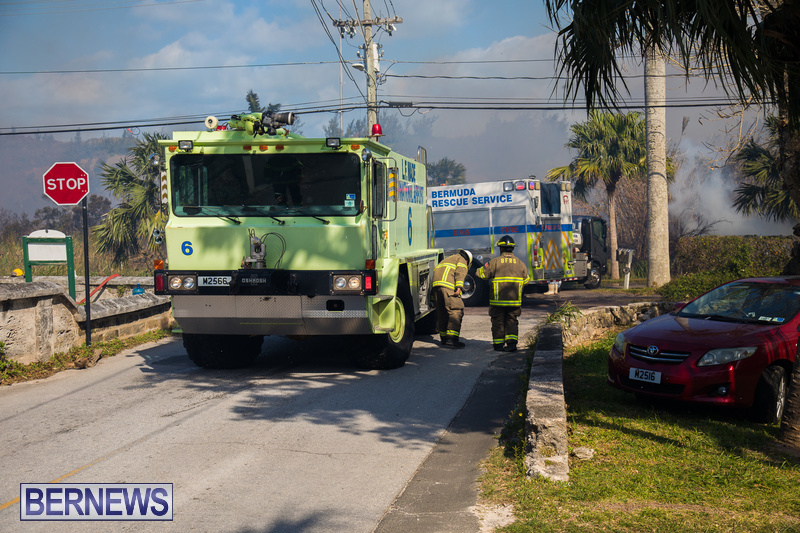 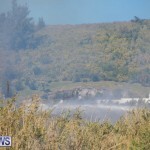 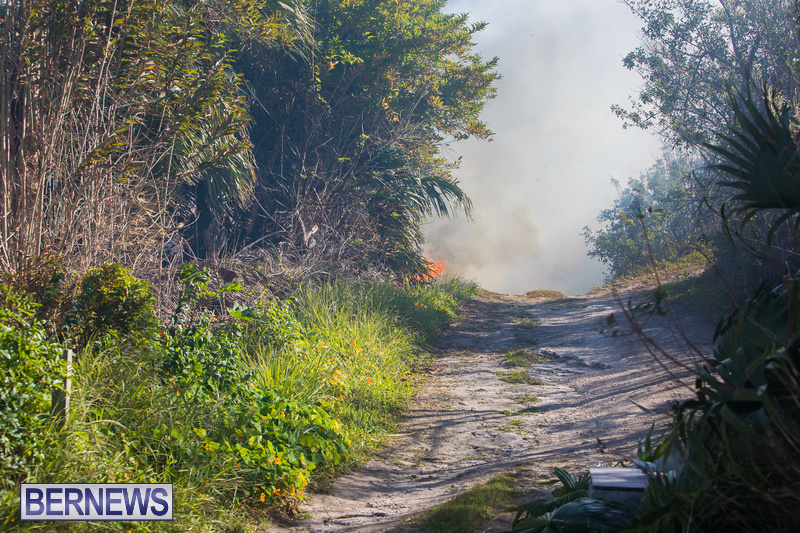 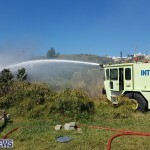 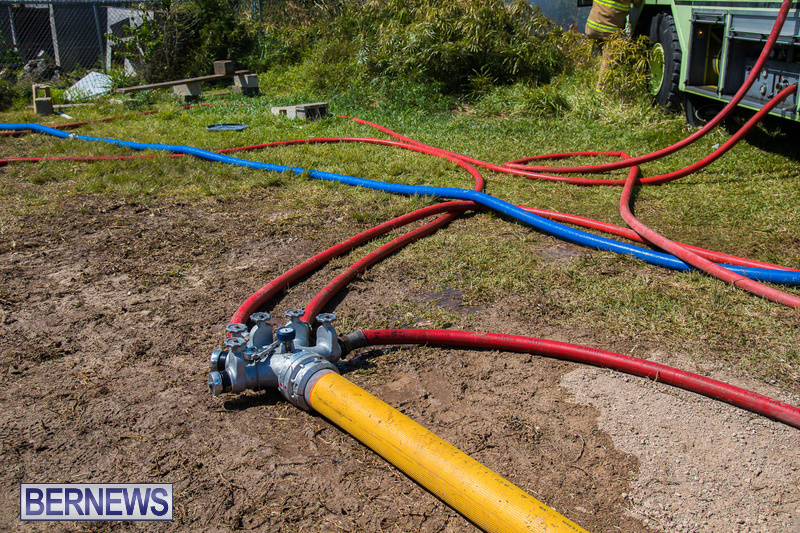 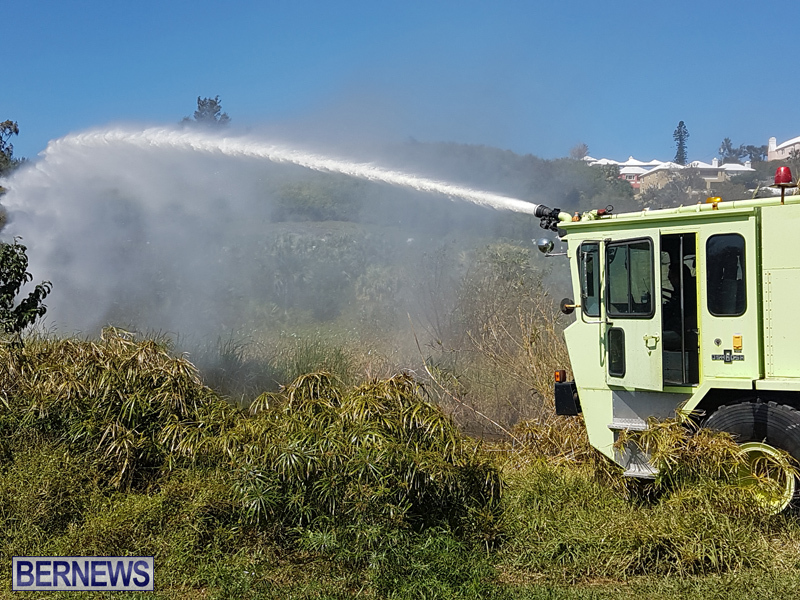 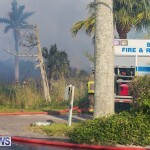 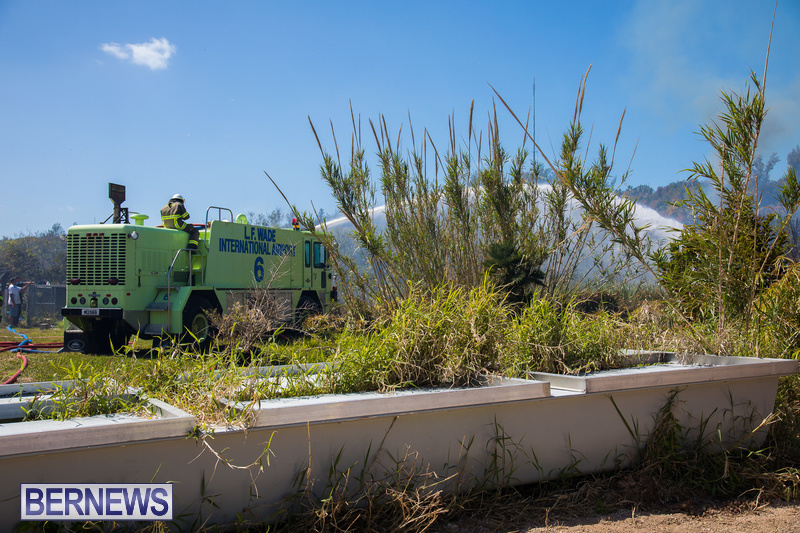 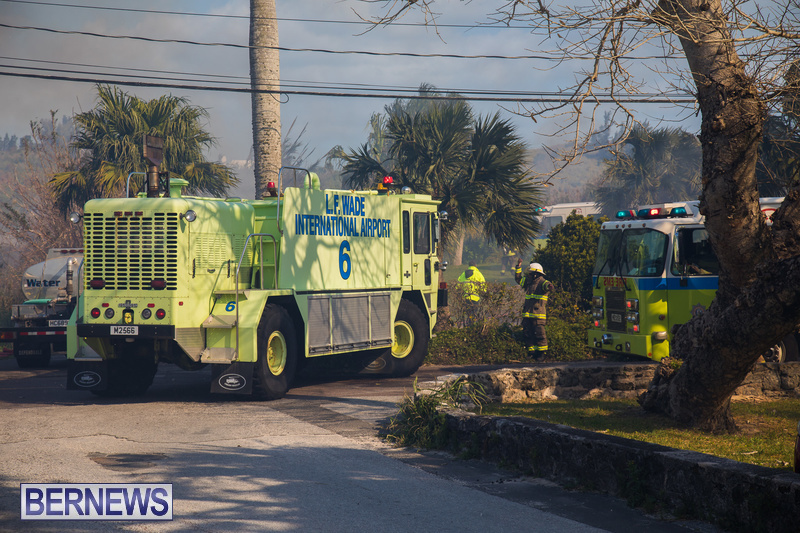 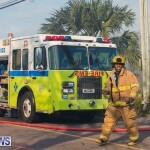 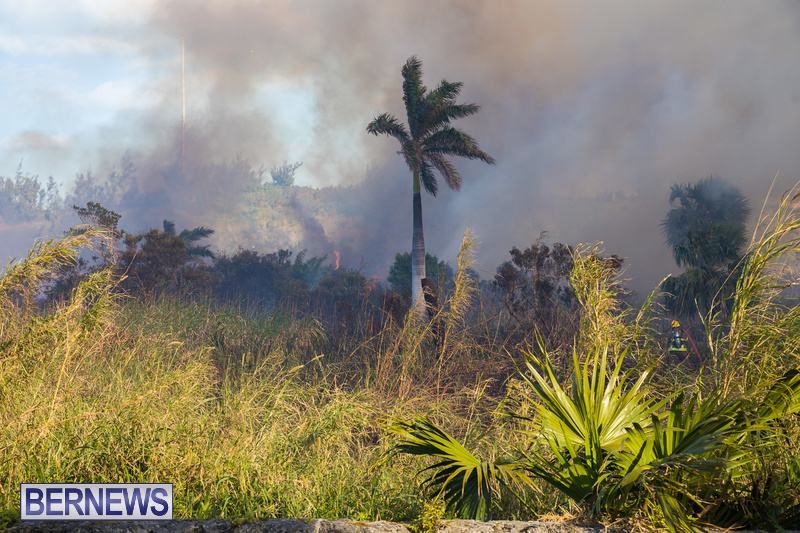 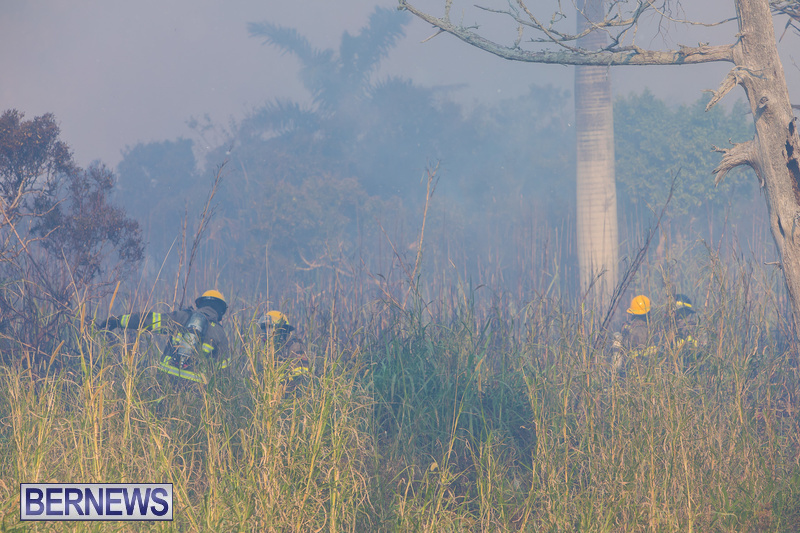 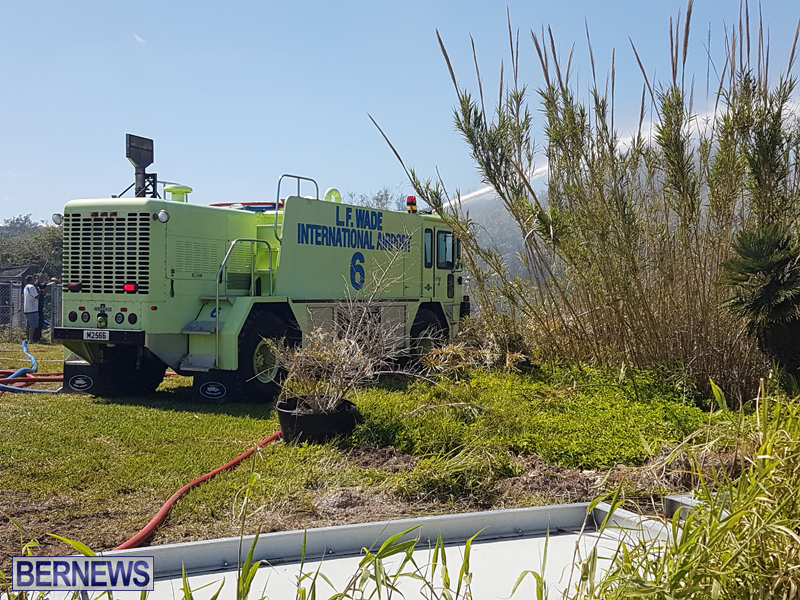 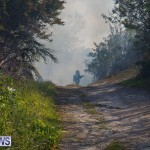 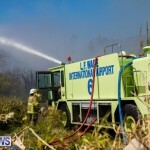 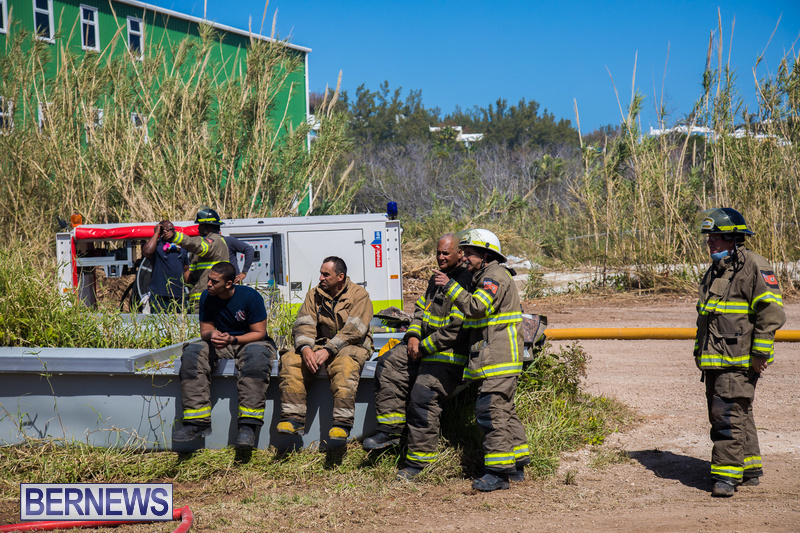 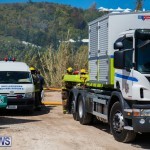 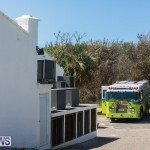 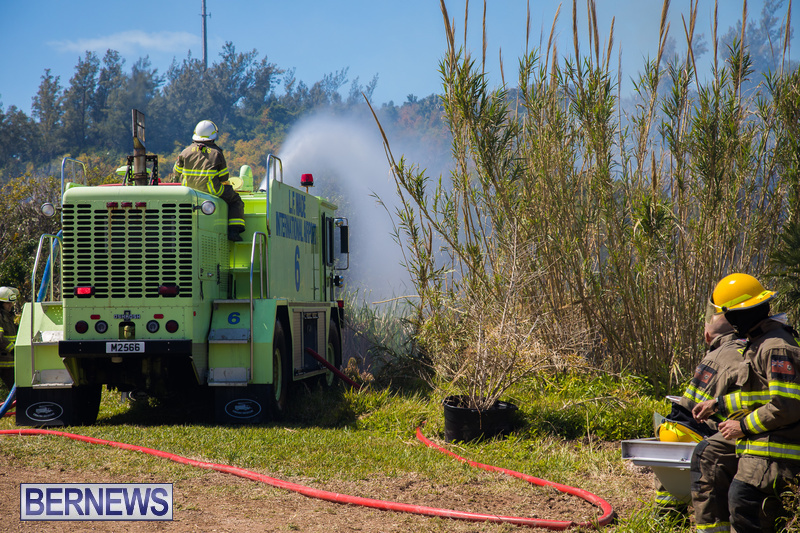 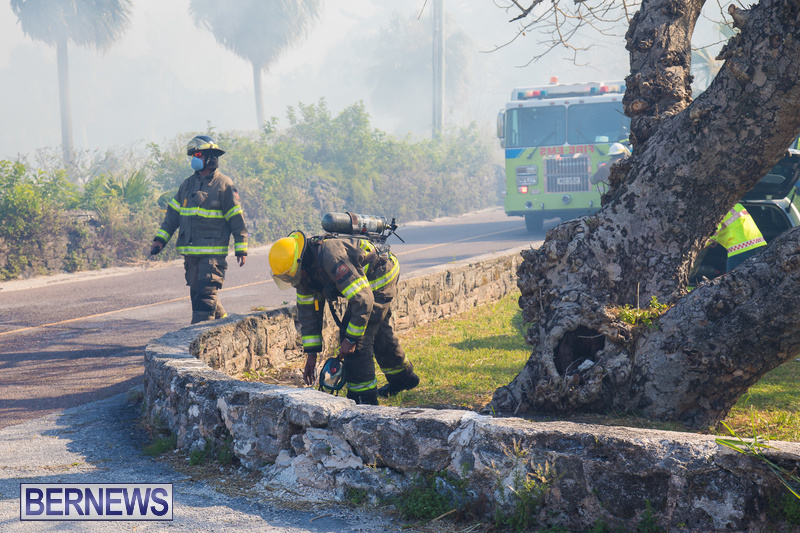 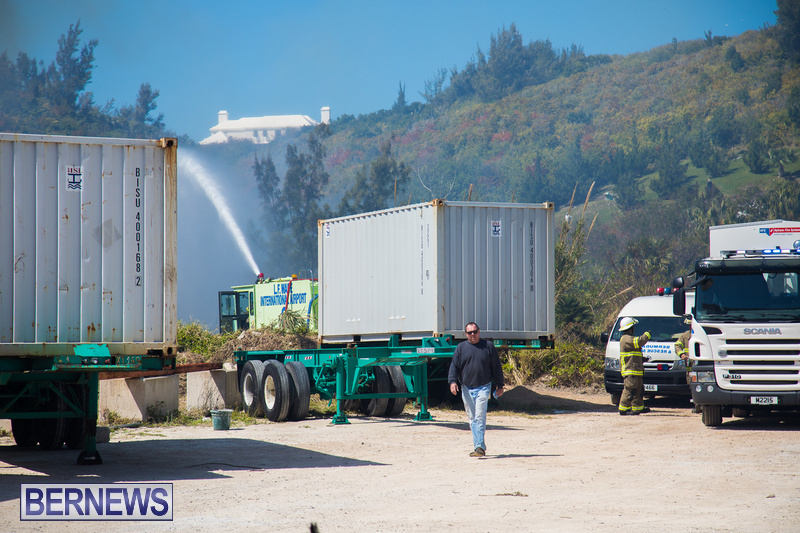 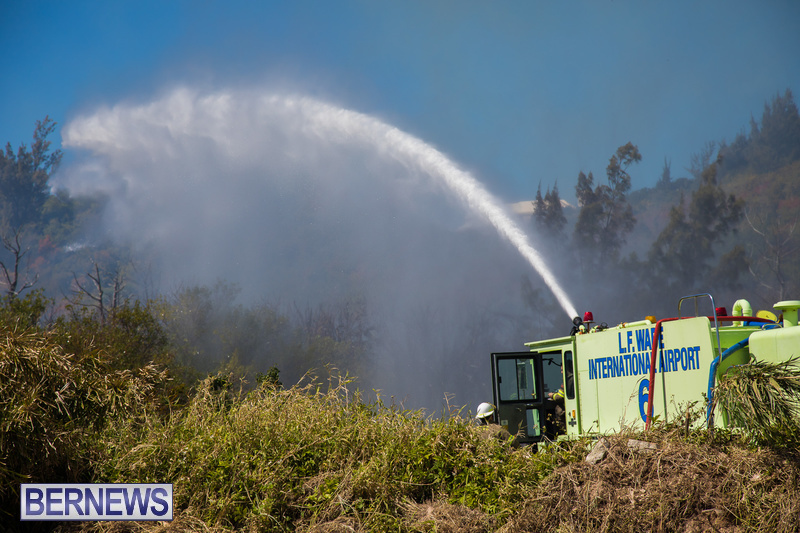 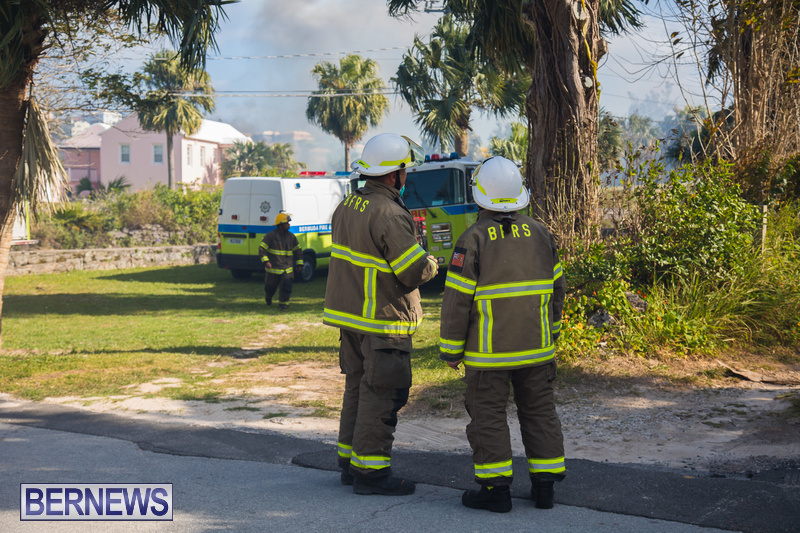 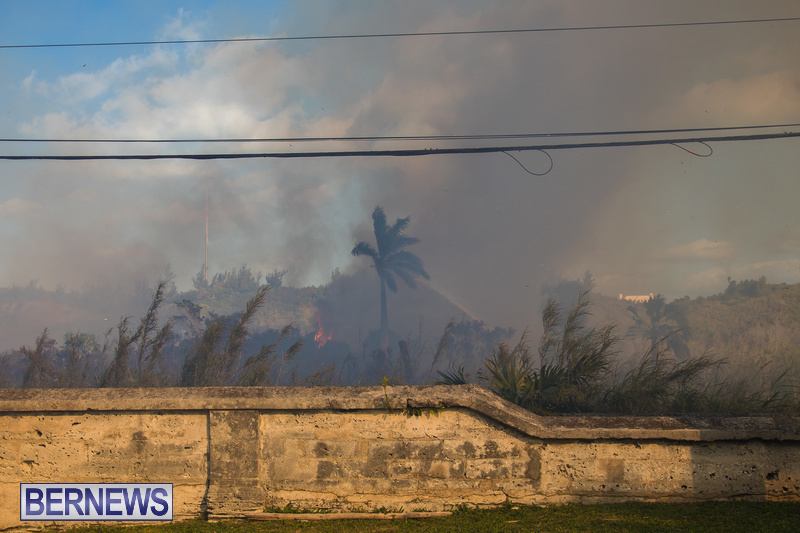 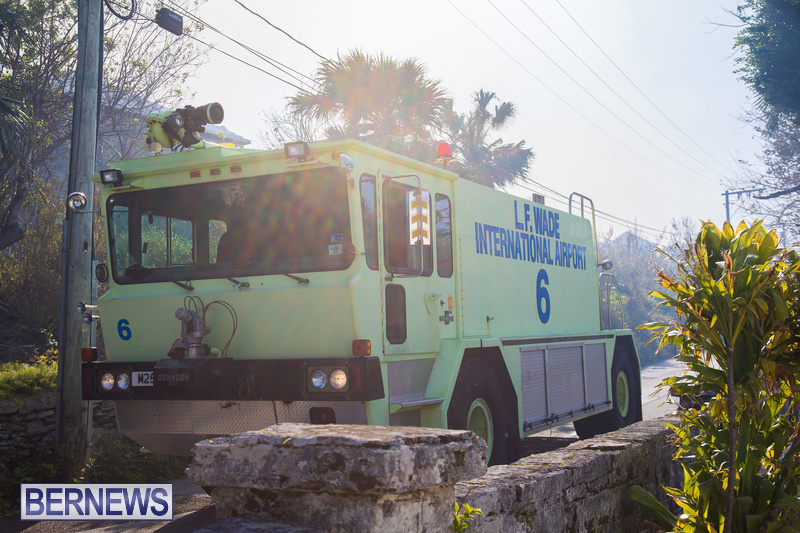 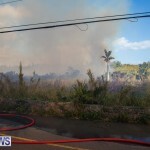 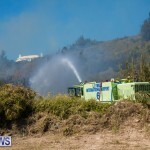 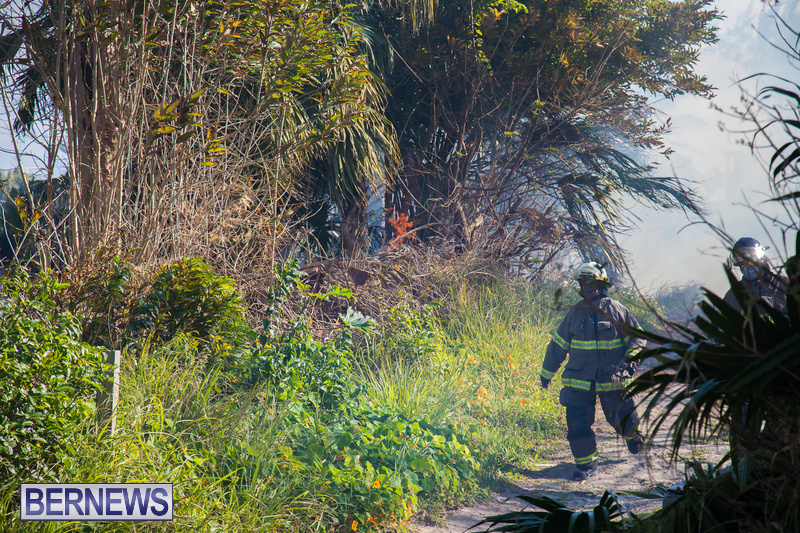 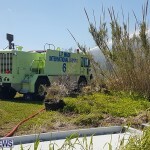 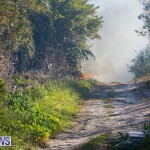 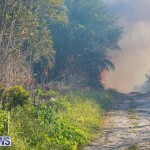 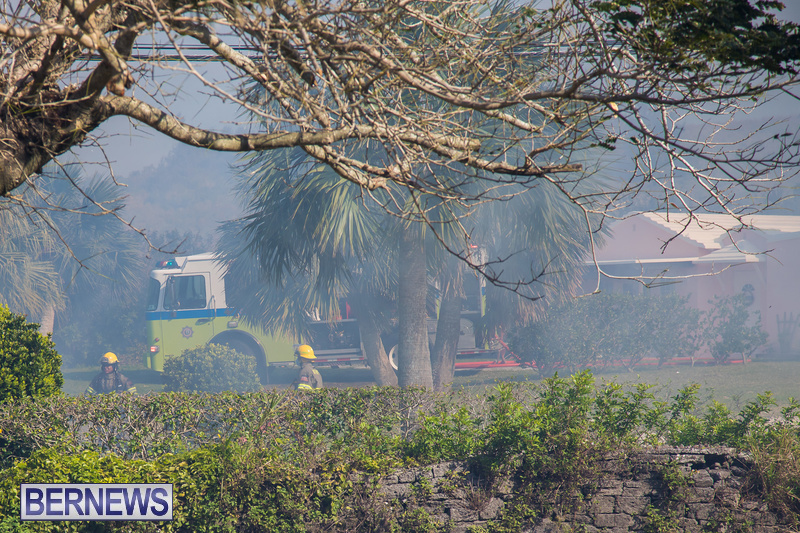 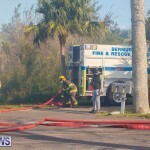 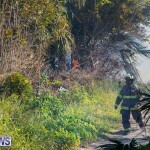 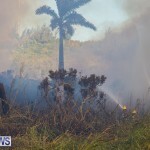 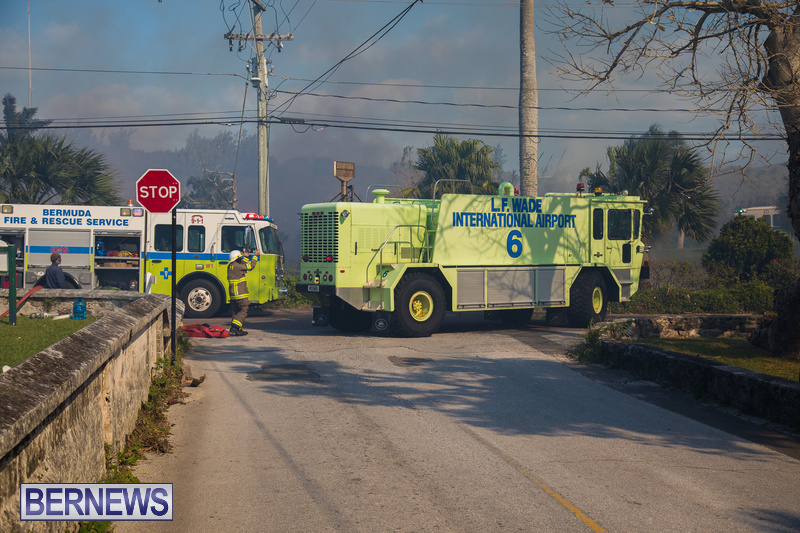 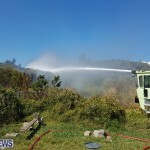 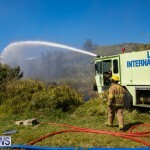 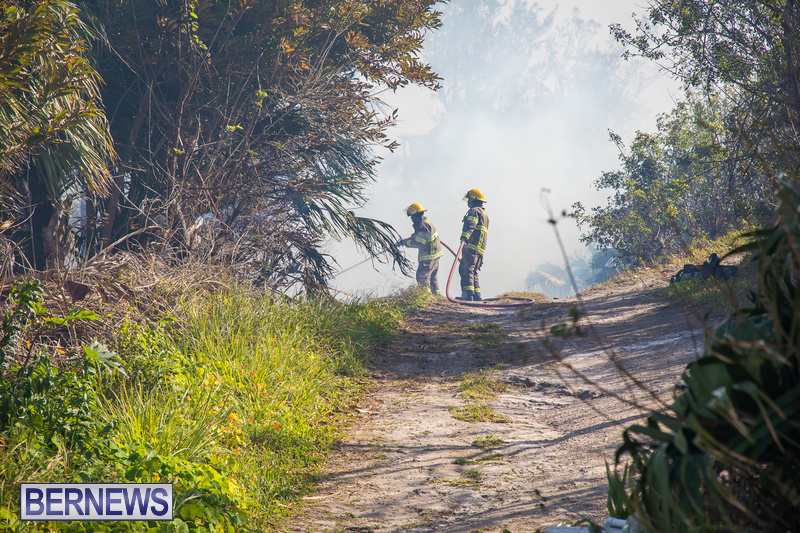 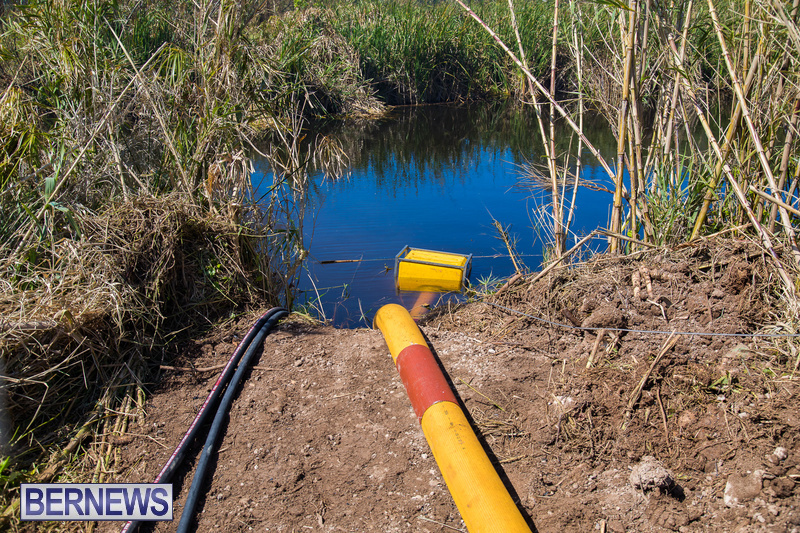 Lieutenant Francis of the BFRS said, “The Bermuda Fire and Rescue Service Emergency Dispatch Center received a call for a brush fire at 0820hrs in the marsh near the Island Construction grounds. 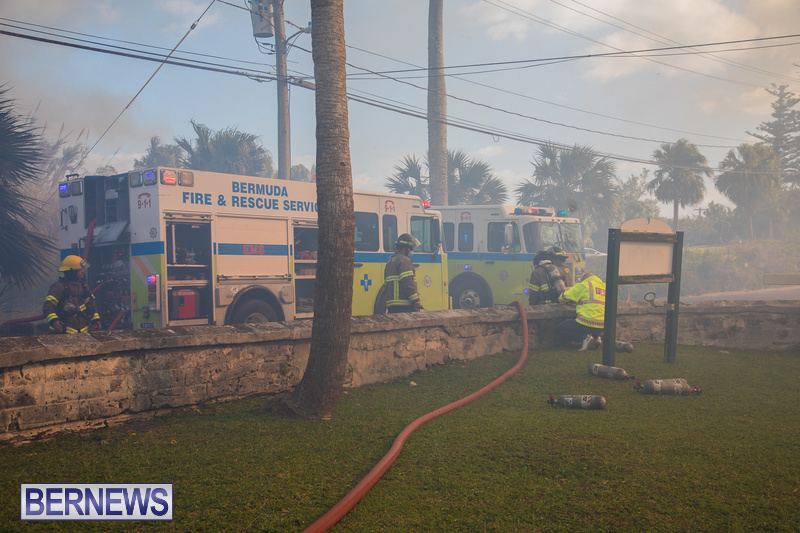 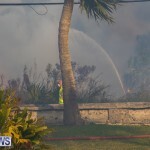 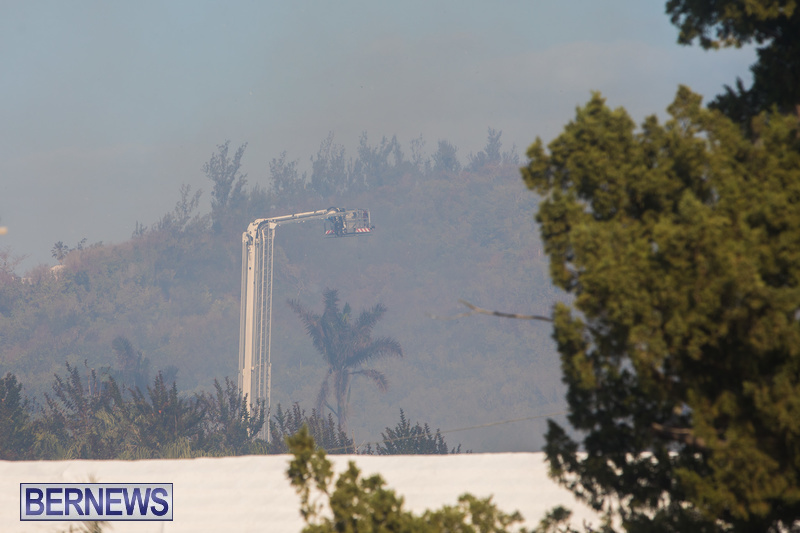 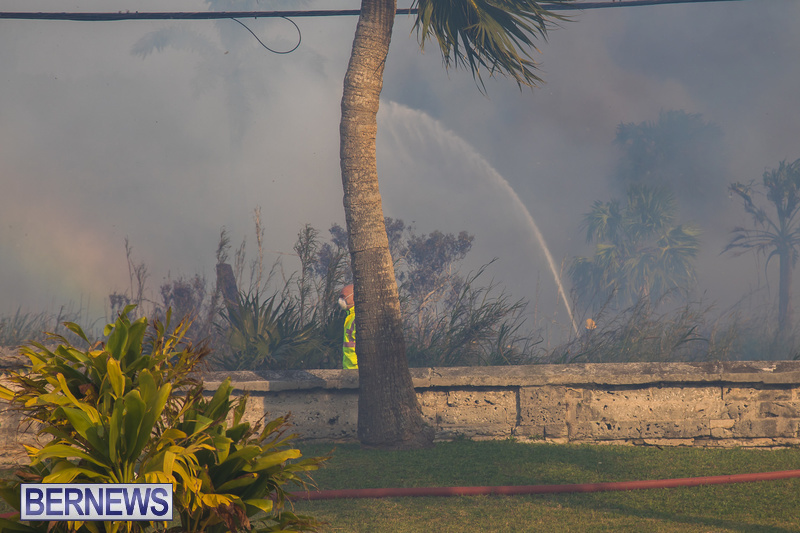 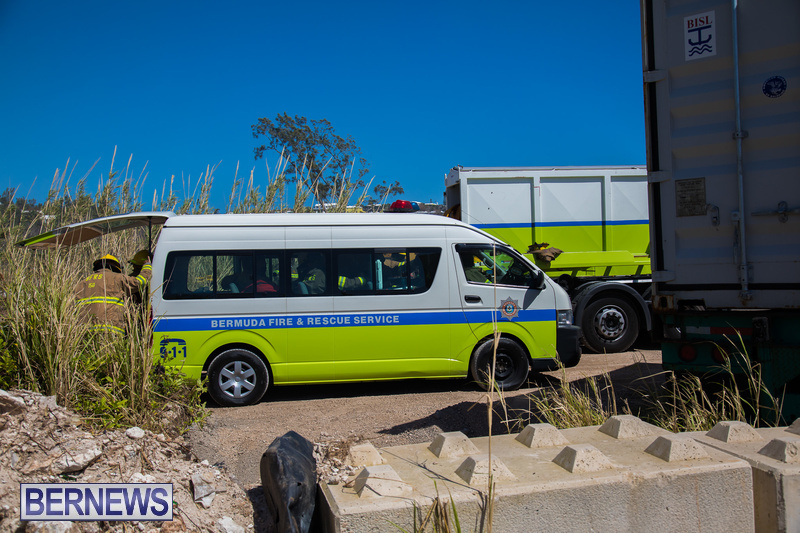 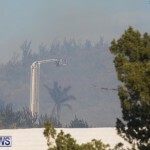 Dwayne Caines, from Bermuda Police Service said, “Presently there are major traffic diversions around the location of the fire. 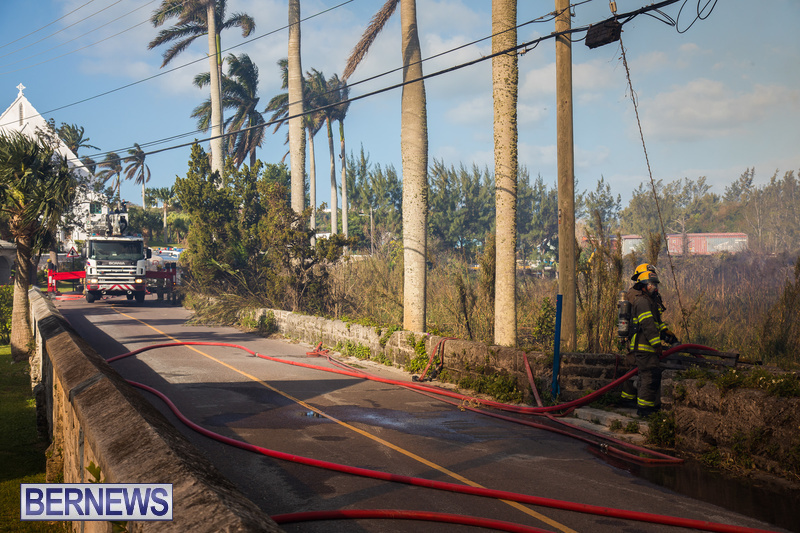 We are asking for the public to please stay away from the area until the fire is fully under control. 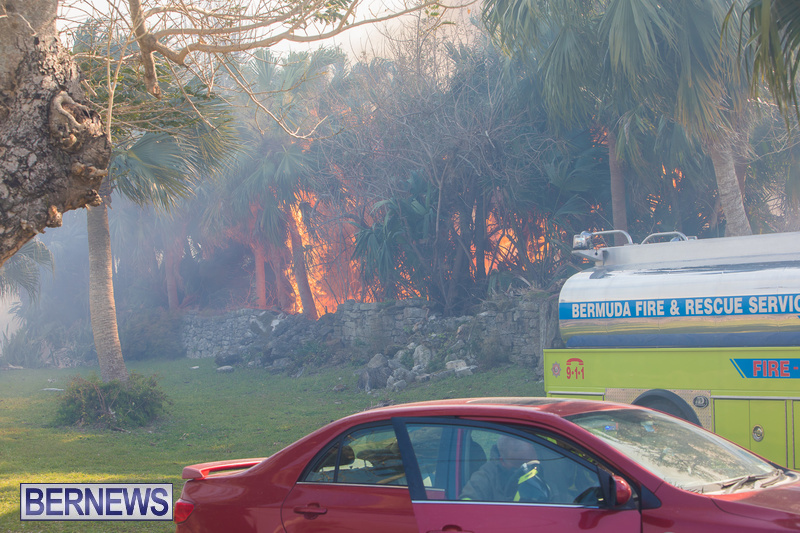 Update 11.20am: The fire has traveled east, and also some sparks and flames can be seen at a property across the road. 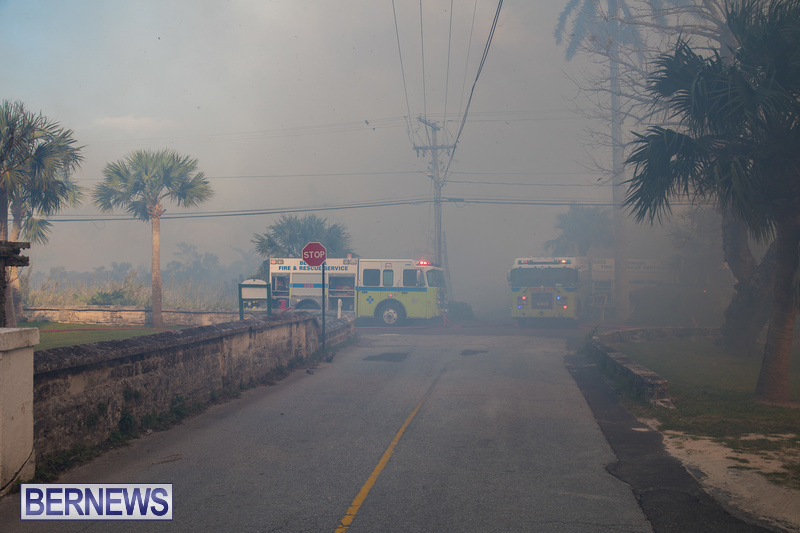 Smoke continues to pour out, and what appears to be ‘ashes’ are also in the air. 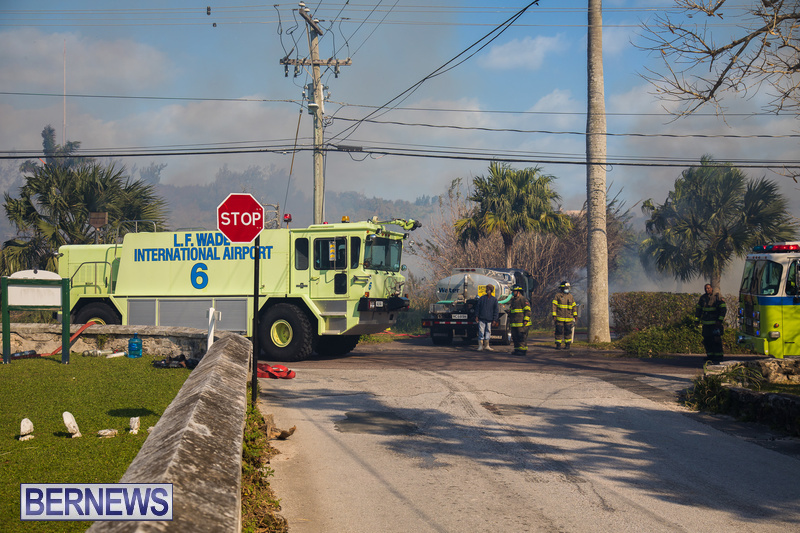 Water trucks, the ladder truck and an airport fire truck are on scene. 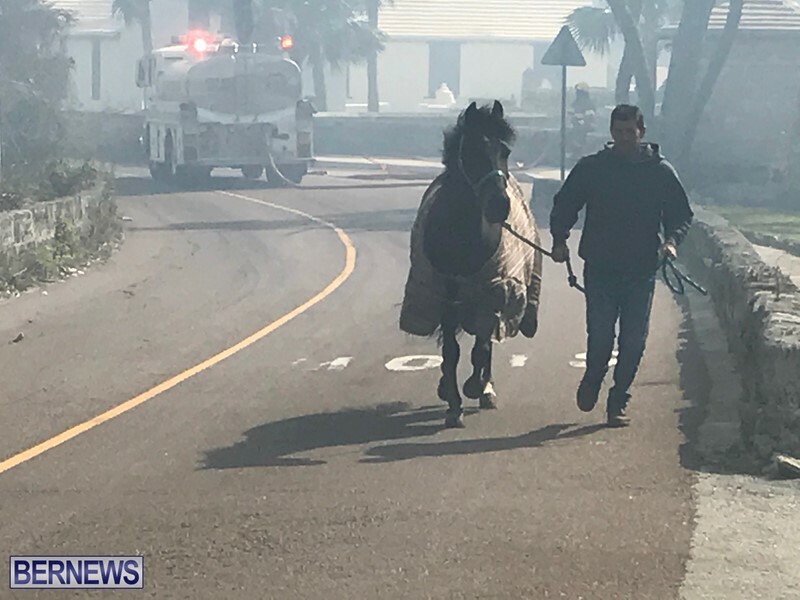 Update 12.10pm: A man was seen running down the street with a horse, leading him/her to safety away from the fire and smoke. 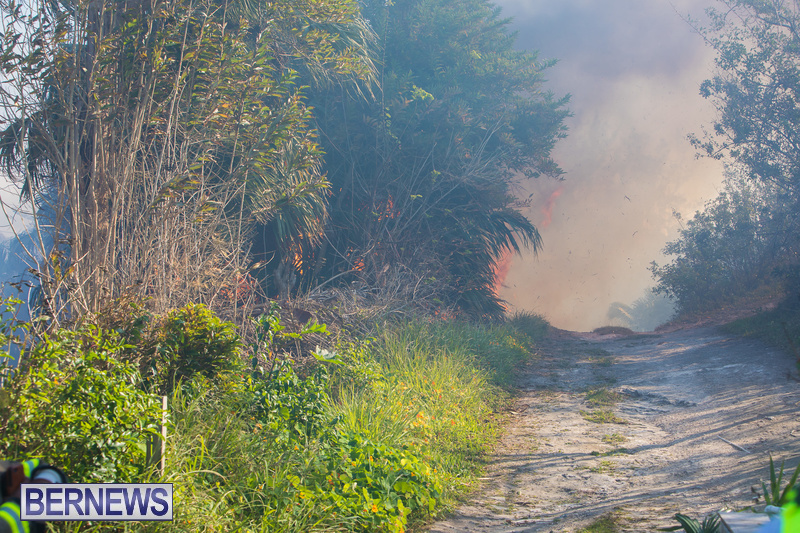 Update 5.15pm: The fire has been contained, full report here. 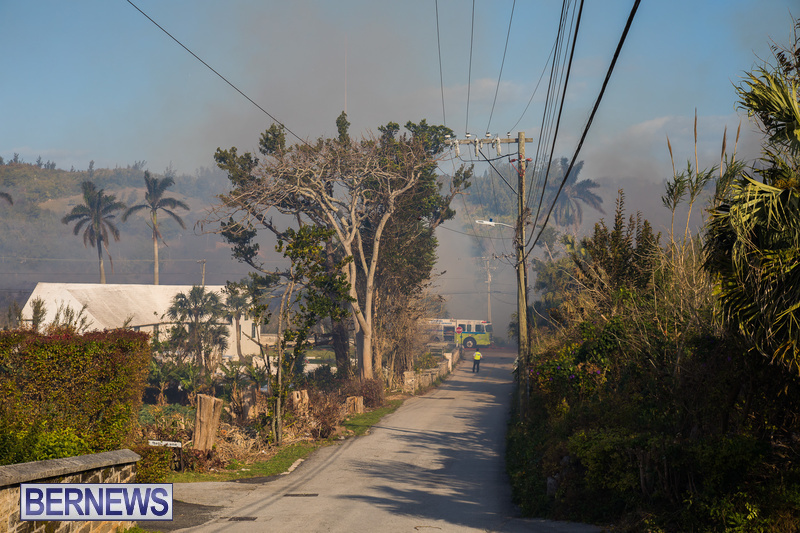 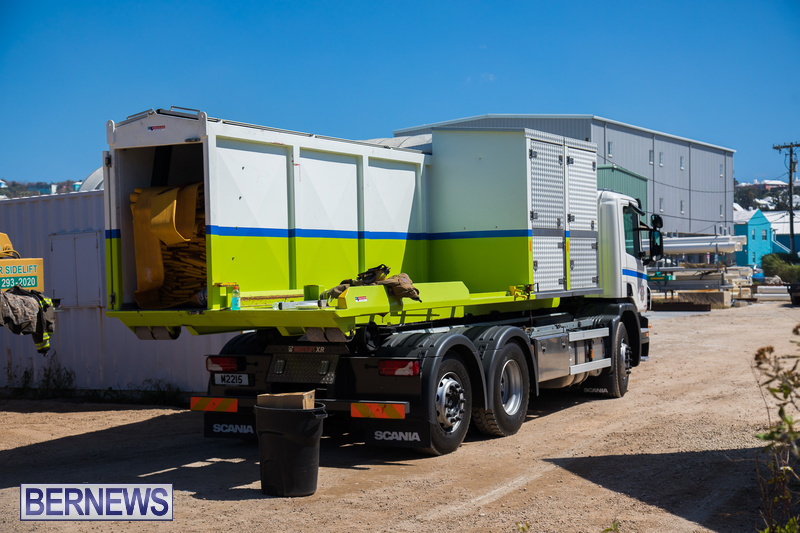 Fire Service spokesperson, Lieutenant Russann Francis, states that “initial reports are that there was heavy smoke with flames that rushed from the area near Island Construction garage yard and were heading toward the Middle Road and Brighton Hill Road junction in Devonshire. 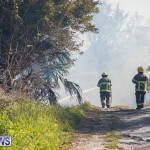 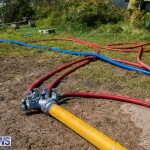 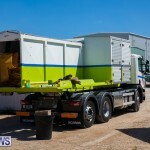 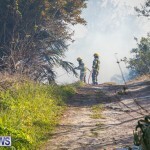 “Due to the high winds, which severely posed a challenge for firefighters, embers from the flames were blown to areas of dry trees and grass which caused the fire to spread. 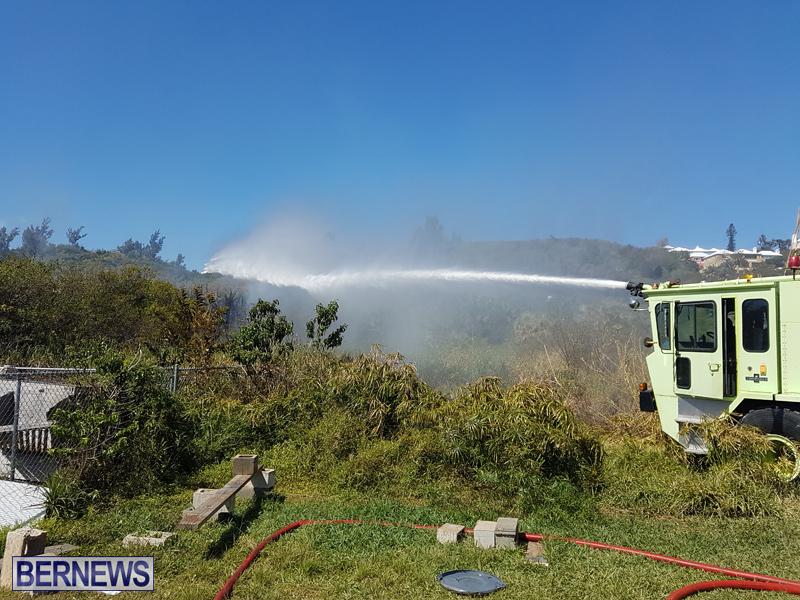 We quickly responded by dividing resources to make a 3-point attack which helped to restrict further spread of the blaze to any exposures. 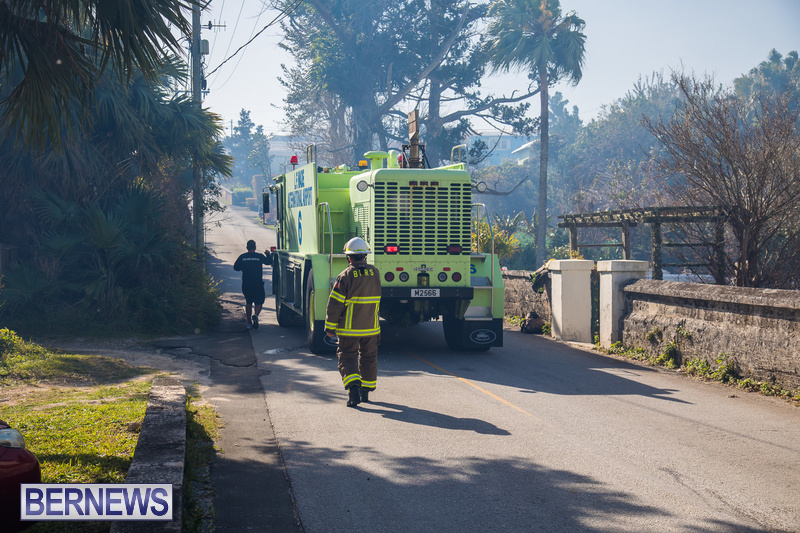 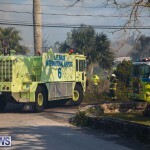 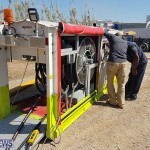 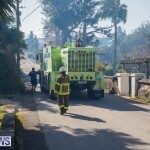 “The fire was eventually brought under control at approximately 3:00pm with the roads open to traffic; however, crews will remain in the area during the daylight hours for the purpose of wetting down hot-spots and areas of concern to prevent the potential of re-ignition. 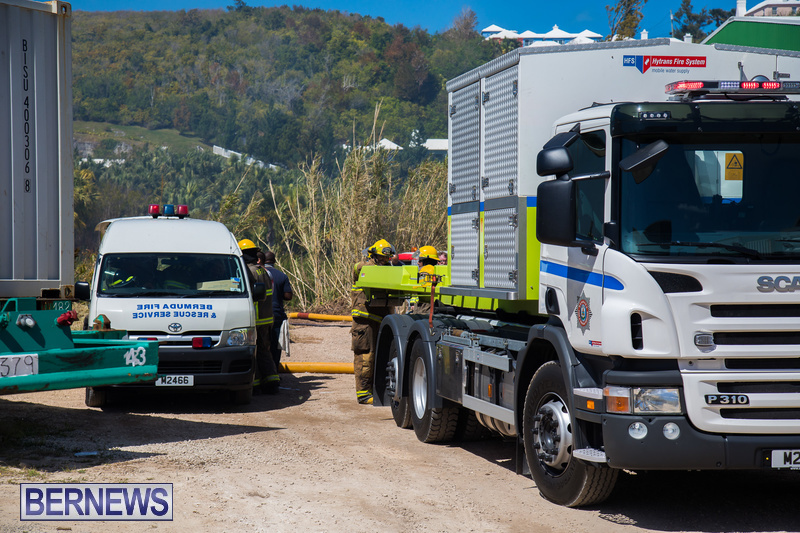 We responded to the incident with all available vehicles and personnel. 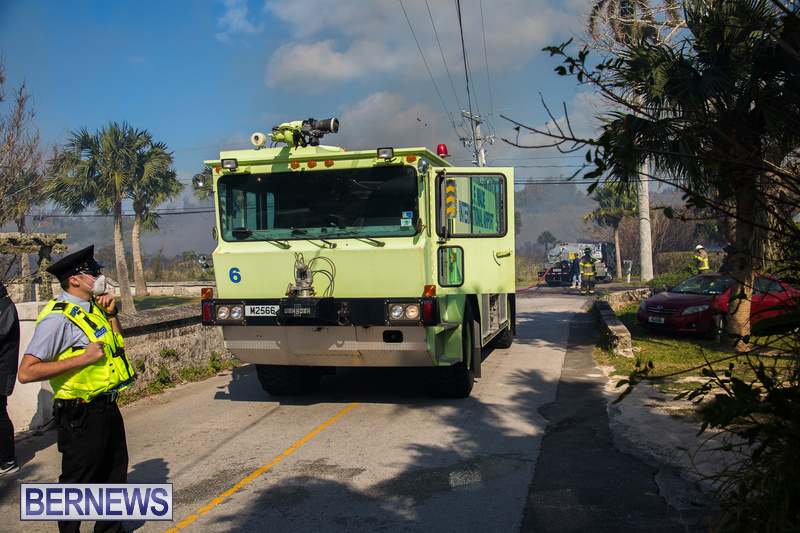 ”At this time the BFRS would like to take the opportunity to thank the motoring public for their patience as we worked to get the flames under control. 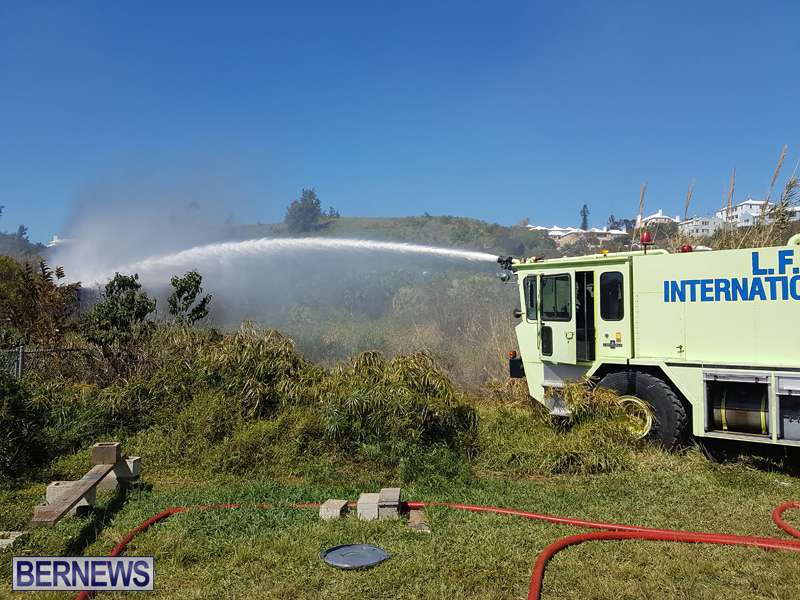 We would like to thank all members of the public who assisted by providing water to extinguish the flames, and for those who provided refreshments for our firefighters. 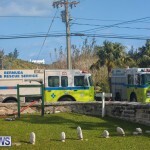 We also thank the Bermuda Police Service for their assistance in securing the roads for everyone’s safety. 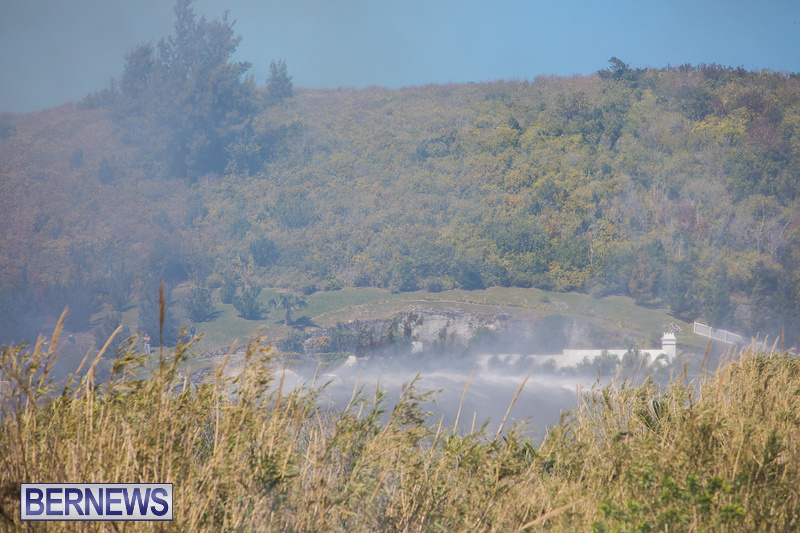 Must be all that hot air from parliament hill yesterday. 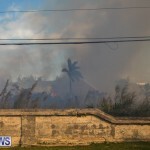 What an insensitive comment! 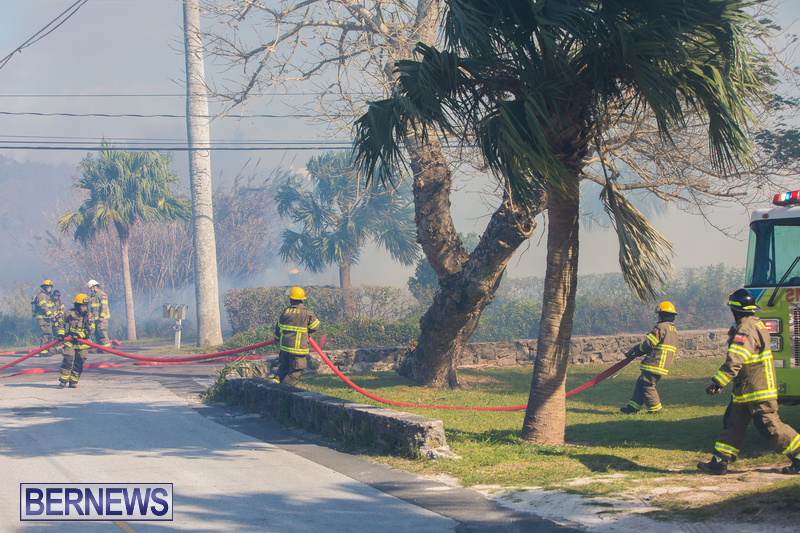 We have residents in the area who are being affected. 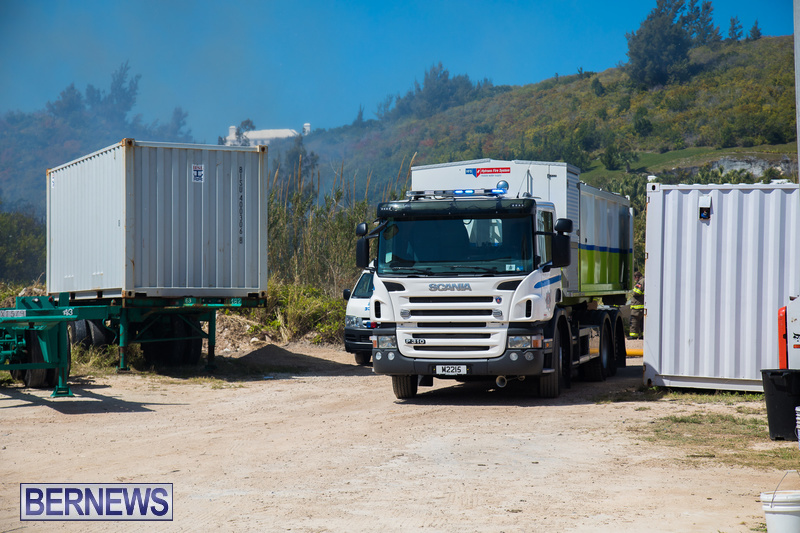 Thank you for the coverage Bernews. 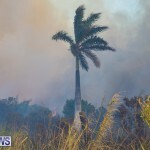 It’s almost like being there ! 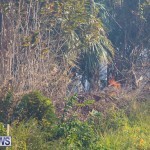 Anyone please give updates. We have evacuated our home and only have one of two pets. 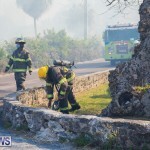 We want to go back to look for our cat and see what is happening. 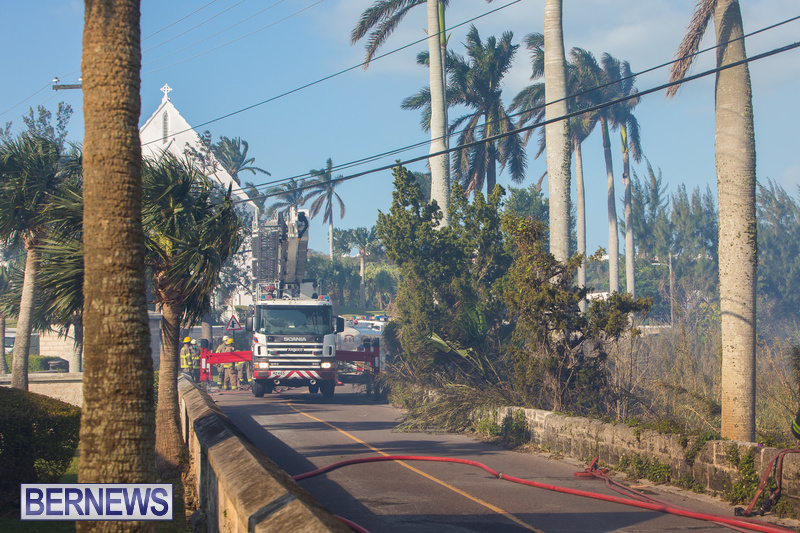 Can some one please explain to me why W&E are continuing to work on railings on North Shore Road with a traffic light up and traffic backed up all the way to Clay House Inn from where they are working, makes no sense with Middle Road closed. 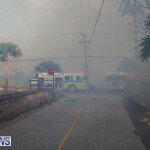 I I know it’s probably over time for them but my God the amount of traffic that is backed up. 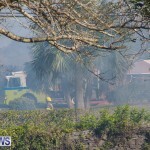 Is it really necessary to continue work today. 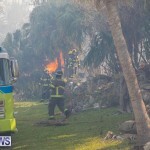 No common sense, just came through that nightmare, shut it down!!! 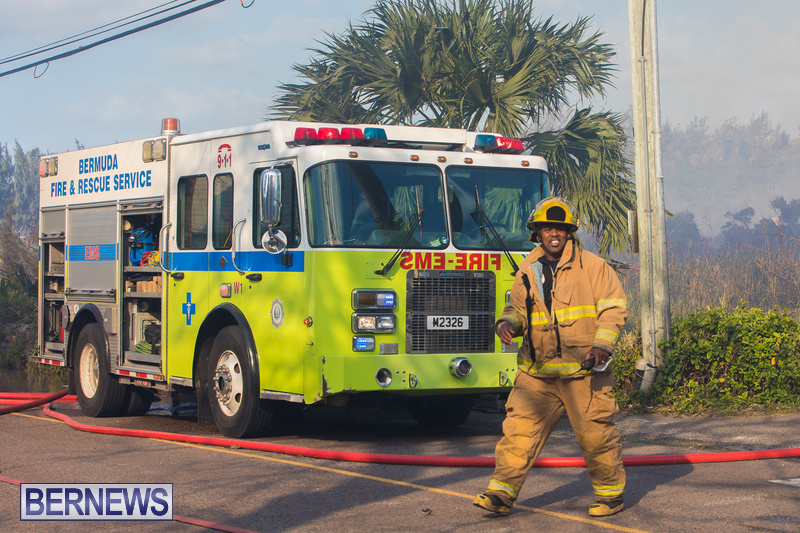 South road backed up due to collectors hill traffic lights. 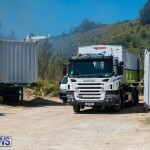 Anyone going East better be prepared for a long wait. 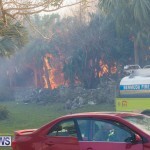 Then there are all of the looky loos getting in the way. 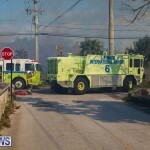 Get out of the way. 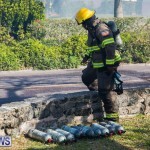 Let the BFS do their job. 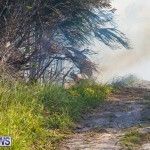 Either that hard wind we had this morning caused lines to spark or someone deliberately set this. 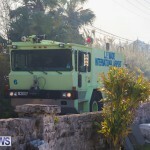 They want overtime obviously. 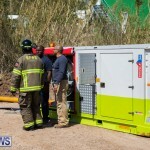 They work very slowly all week stretching out the job so they can get in the overtime. 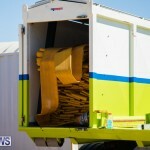 Not one of them could survive working for a construction company. 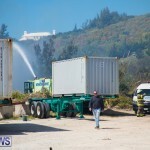 Then they wonder why companies bring in workers. 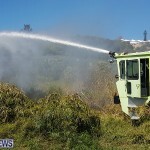 A foreign worker will give you an honest full day of work. 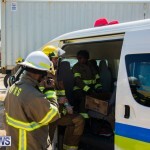 Now a government worker you would be lucky to get 3 hours. 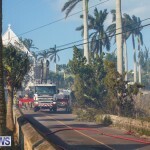 I was in the traffic on North Shore, however I don’t like your comment. 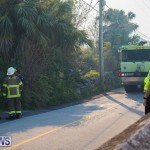 Have you thought they want to repair the road ASAP because it is crumbling due to the rains we have had over the past week? 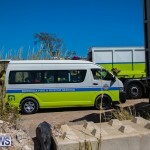 Plus if they did this through the we will hear more complaints of traffic jams. 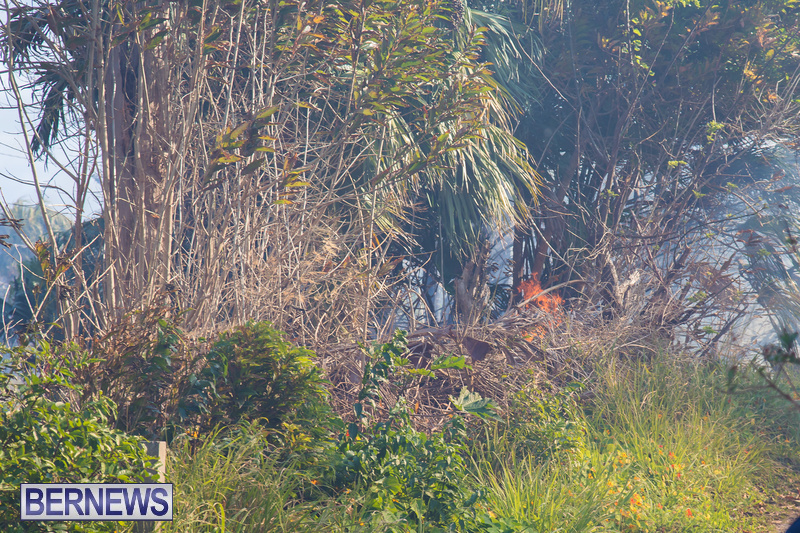 Gee…I wonder where that came from…. 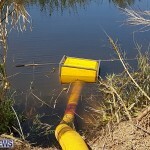 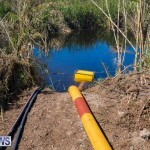 I need this water tested for fuel oil waste or by products of trucks and heavy machinery. 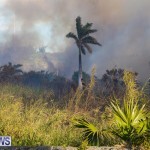 This marsh actually provides food for our reef system…destroy it and you kill our reefs…that’s nasty. 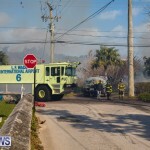 They work for East End Ashphalt dummy! 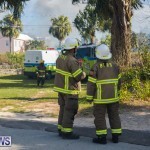 Not Government! 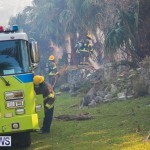 Stop hating and spreading lies!